Shields at 20% and holding! Cat: Why don't we drop the defensive shields? Kryten: A superlative suggestion, sir, with just two minor flaws. One, we don't have any defensive shields. And two, we don't have any defensive shields. Now I realize that technically speaking that's only one flaw, but I thought that it was such a big one that it was worth mentioning twice. Also called "Force Fields", these are invisible (or, if the budget allows it, barely-visible) energy barriers placed around objects to protect them from harm. Most common around space ships, but also seen around bases and — very occasionally — individual people. How much protection they offer is usually proportional to their power. This also makes for yet another reason you are boned if the energy runs out. They may also be subject to Phlebotinum Overload if they get hit by too many Energy Weapons. An energy barrier can zap or repel anyone who touches it, or can simply behave like an impenetrable wall. It's often represented in the form of a Beehive Barrier or another Hard Light construct. In practice, this is somewhat less scientifically feasible than Energy Weapons, but not by much, at least in the way it is usually depicted — a strong electromagnetic field really can be used to deflect particle beam weapons or railgun/coilgun slugs. A better example is the Earth's magnetic field which safeguards us from charged particles in the solar wind. NASA and ESA are actually researching how to reproduce the effect on future interplanetary spaceships, to protect Mars travelers from cosmic radiation. Shields may be handled as a single egg-shell or as several independent barriers covering different areas of the ship. The latter encourages certain maneuvers, such as making sure your shielded side is always facing the enemy. Shields are popular in fiction because it allows the Cool Ship to participate in battles without the inconvenience of having to spend the rest of the episode making repairs to physical armor and systems. In older or lower-budget movies and TV, they also eliminate the need to show battle damage on the ship; e.g. having your Ensign call out "Shields down to twenty percent!" can be a lot cheaper than showing a gash blasted in your ship's armor. The downside is that creators often have to resort to Explosive Instrumentation to provide combat casualties on a shielded ship. In somewhat-harder science fiction, shields are useful to overcome the seemingly overwhelming attacker's advantage — cities on planets can't dodge, so if there isn't some way to defend against space-launched missiles and kinetic projectiles, wars are going to be short and boring. In Video Games, deflector shields have a special use. They are effectively a way to justify regenerating hit points, but only for a part of a unit's health. Shields get to regenerate, but if there is something beneath them, like armor, the armor doesn't regenerate. Also, for many games where a target can take Subsystem Damage, that won't start until you penetrate the deflector shields. Compare and contrast Containment Field and Reinforce Field. See also Some Kind of Force Field for the scene where an otherwise-invisible shield is identified by touching it. In Valvrave the Liberator, Module 77 (the Dyson Sphere structure our heroes live in) has mobile deflector shields, but they aren't large enough to defend the entire module-which is essentially a space city. Instead, they have to be moved like hand-held shields to block attacks. The sole reason The Big O is still standing is due to Big O's impossibly sturdy arm plating which, over the course of the series, repels lasers, punches, swords, missiles, machine guns, and giant drills. The entire city gasps when his enemy, Big Bad Alex Rosewater's robot, turns out to have a personal force field; the viewer is subsequently treated to a good five minute montage of Big O punching away uselessly from a variety of television sets. Combattler V: The Nanbara Connection was protected with a semi-spherical energy shield. Most Robeasts had a hard work breaking it, so The Dragon came up with plans to infiltrate into the place and disabling it. In the Mazinger series, the Photon Atomic Power Research Institute and the Fortress of Science Home Bases were equipped with deflective, energy barriers that surrounded the whole building to repel the strikes of the Monster of the Week and raids of enemy ships and airships. Unfortunately, a strong enough Robeast could shatter the barrier by employing enough brute force, and the villains were smart enough to search and blow up the devices that made the barrier working. Super Dimension Fortress Macross: The Macross gained a force field early in its mission. Atypically, for most of its journey, the field could not cover the entire ship, so crewmembers had to move three small shields around the ship to intercept enemy fire. Later, an "omnidirectional barrier" was invented, which overloaded when hit by too much fire, destroying an unnamed large city in Ontario. The Macross also uses focused pinpoint barriers to penetrate said shields, as a justification for space melee combat by kilometer tall Humongous Mecha punching each other. Of particular note is that when the Omnidirectional Barrier overloads, the energy goes outwards, leaving the Macross itself unharmed at the center. This is terrible when hovering above a city full of civilians, but pretty darn useful when hovering inside the command base of a 4-million-ship enemy battle fleet. Later Macross installments have taken the pinpoint barrier idea and applied it to the series's trademark variable fighters, combined with some degree of automation so that the pilot doesn't need to micromanage their placement. The Protoculture are shown to be have been able to project large-scale barriers without the overload problem the Macross had: both the Bird-Man in Macross Zero and the battleship Sigur Valens in Macross Delta are shown to be capable of warping Fold Space to shield themselves from attack. In both cases, these shields could tank a tactical nuclear warhead without too much trouble. The title spaceship in Martian Successor Nadesico has a Distorion Field that can deflect the lizards' gravity-based weapons along with more conventional attacks. The Jovians use the same technology, and the Nadesico crew eventually develop a special shield-piercing lance for their mechs. It should be noted that Nadesico's Distortion Fields actually deflect incoming fire. Enemy shots literally bounce off or curve around protected units. GaoGaiGar has the "Protect Shade" and upgraded "Protect Wall", which not just block beam-based attacks, but actually bend them into a pentagram before flinging it back at the attacker. The most common one is the I-Field, which only protects against beam weapons, as all it does is make a cushion of particles that stops anything with less mass than the particles. They also made specialized versions to keep ships aloft in the air. Later, they developed the Beam Barrier/Beam Shield, which is basically a really wide Laser Blade that could be used against physical attacks as well. In Mobile Suit Gundam: Char's Counterattack, the Nu Gundam can form an impenetrable, pyramid-shaped "Fin Funnel Barrier" with its Fin Funnels. Mobile Fighter G Gundam has a variation: shields to keep weapons fire contained, during the Final Round matches of the Gundam Fight, thus allowing support teams and spectators to watch safely. There is one case of sabotage that forces one Gundam Fighter to serve as a shield in order to prevent Spectator Casualties. For the final Battle Royale, the entirety of the abandoned Lantau Island is sealed off by a force barrier, with only the competing Gundams on the island, though when the Devil Gundam makes its move, the support teams for our heroes work together with Schwarz Bruder to break through so Schwarz can help stop the Devil Gundam. The Mercurius Mobile Suit and Virgo Mobile Dolls from Mobile Suit Gundam Wing had Planet Defensors, Attack Drones that generate a forcefield capable of blocking most ranged weapons. Their only weaknesses seem to be lasers and melee attacks, but this is usually offset by the Virgos' powerful beam cannons, their working in teams, and the rarity of weaponized lasers in the setting. In Mobile Suit Gundam Seed Destiny, the Destroy, Destiny, Strike Freedom, and Legend Gundams, as well as the DOM Trooper, feature arm-mounted beam shield generators on both arms. The Infinite Justice has a single "Beam Carry Shield". The Mobile Armors Zamza-Zah and Gells-Ghe also carried these weapons, powerful enough to block a Wave Motion Gun shot. The Akatsuki, with its Shiranui Space Pack, can form a pyramid-shaped barrier with its attack drones (in an homage to Nu Gundam's Fin Funnel Barrier). Earlier, with Mobile Suit Gundam SEED Astray, the Hyperion and Dreadnought Gundams have powerful barriers. The Hyperion could only use his for 5 minutes before his battery drained. Once its pilot gained the means to use infinite power, he ran with it. The Gundams from Mobile Suit Gundam 00 also field beam shield technology. Their GN fields were based on the particle density with a field that holds the particles in place. The GN field's strength is based entirely on how densely packed the particles are to deflect the oncoming projectile. The effect of it is largely made to dissipate and deflect beam attacks but a sufficiently powerful attack can either force its way through or completely overwhelm the field itself. However there are specifically weapons that were made to counter GN fields so while it protected against mostly everything, GN blades can still pierce through with minimum effort. The field itself was later weaponized by the Seravee. It allows the Seravee to store Particles externally and fire them without having to internally process the blast because the field can now contain the particles. Sonic X has Perfect Chaos create a spherical shield of water around itself when Eggman attacks in the Egg Carrier II that effortlessly stops the missile salvo he launched. The shield proves useless against Super Sonic, though. The energy shields in Kurau Phantom Memory are specifically tailored for deflecting and containing Rynax-energy. They don't usually form much of an obstacle for the protagonist though. This is done in several different ways in Pokémon. Mr. Mime can create invisible barriers. The attacks Protect and Detect do the same thing in the games. In the Pokémon Adventures manga, Sabrina's Pokémon can make invisible forcefields, encircling the entirety of Saffron City at one point. In Pokémon: Destiny Deoxys, Deoxys creates a force field around LaRousse City to keep Rayquaza out. As well as blocking physical objects and energy blasts, the force field blocks any air movement from outside the city, which is bad for our heroes as all systems in LaRousse city, including the doors and the security robots, run on wind power. In Naruto, Neji uses this to protect himself from Kidomaru's kunai attacks and spiders. Unfortunately, he manages to find a way around it using his blind spot. Code Geass has two different versions, one for each of the major military factions. The MSV maser shields used by Britannia appear on the Lancelot as beam shields a'la Gundam before developing into full-on Deflector Shields and being applied to some Ace Customs and larger devices such as the Cool Airship Avalon (and eventually the Kill Sat Damocles near series' end). The Black Knights develop the Guren Mk-II's radiant wave attack system into a shield called the Radiant Barrier and install it in their commander mecha and battleships in the second season. Worth special mention is the Shinkirou, protagonist Lelouch's Ace Custom machine: its Absolute Protection Territory uses an array of MSV maser shields that require on-the-fly coordination by the pilot, meaning that only someone incredibly intelligent can use it to its full potential (that being the strongest shield system in the Geass-verse). In Neon Genesis Evangelion, the Angels and the Humongous Mecha are protected by "AT Fields", energy shields that are impenetrable by conventional weaponry (well, technically they can be pierced with normal weapons... it just takes an unbelievable amount of power to do it, ie, far more than a nuke would be capable of). It is eventually revealed that AT Fields are actually an extension of the soul, and that humans generate them too, but since humans lack the unlimited power that Angels are capable of generating, their fields are far too weak to affect the physical world. That said, it is those weak AT Fields that keep human minds and bodies together and separate from everyone else. Remove them and tangification starts. The alien invaders and the title robot in Cannon God Exaxxion use force fields that are an offshoot of their Artificial Gravity tech. They have rendered most types of weapons obsolete, with the exception of BFGs & melee weapons wielded by extremely strong combatants, the idea being that the only way to penetrate such a barrier is to focus more energy on a single point than the system can produce. Explosives don't work, as their energy is spread too thin & lasers are right out due to gravitational lensing. In the second part, Clef casts a titanic magical barrier around the Palace of Cephiro, which drains even the Master Mage nearly unto death. It's even worse for him when the invading NSX fires its twin Laguna Cannons into it. The NSX itself has its own, technological force field. However, the ship still sustains damage when the giant San Yun smashes its fists into the barrier. One of the manifestations of the Lighthawk Wings in Tenchi Muyo! is as a defensive shield for a ship. This is provided either by the tree providing the ship's power, or very special individuals. The Vandread Jura's main power was its Beehive Barrier and could even protect an entire planet. The super Vandread used it as a personal shield as well. Super Atragon: The undersea-battleship Ra has one of these that stops even gigantic enemy cup-shaped things from crushing it. Saki and Mai/Cure Bloom and Cure Egret of Futari wa Pretty Cure Splash★Star can create barriers — going so far as to create ones big enough to protect their fellow Cures. Komachi/Cure Mint of Yes! Precure 5 can also do this and ends up weaponizing it when she gets a "Mid-Season Upgrade" in Yes! Pretty Cure 5 GO!GO!. In Mahou Sensei Negima!! the top-tier members of the antagonist group, Cosmo Entelechia, are nigh invulnerable, thanks to their possession of "multi-layer mandala-style barriers" that are almost completely impenetrable to any form of physical and magical attack. These are the reason the Fleet of Fog from Arpeggio of Blue Steel are able to completely dominate the world's oceans and impose a global blockade on humanity. That and the Frickin' Laser Beams. Ulysses 31: The heroes' ship, the Odysseus, is protected by a large, ovoid deflector shield that has saved it from destruction on many occasions, including against the mighty Cyclops. Any tridents attack is doomed to fail when the shield is up, but can be devastating if the undermanned ship is taken by surprise without time to erect it. Capital ships in Legend of Galactic Heroes are equipped with them, although they appear to be vulnerable to concentrated fire. Superman villain Brainiac uses both kinds of shields. In Superman: Brainiac his ship is protected with a force field powerful enough to shield it from an supernova. He also uses a personal force field. In his origin story Action Comics #242, said shield was so powerful that even Superman couldn't punch through it. Calvin's box-plane has one of these. One alien ship from much earlier in the series has their broken by a firecracker. The lairs of Brainstorm and Thunderstorm have these as well. In Atlantis: The Lost Empire, the title city has guardian golems which project an impenetrable protective shield over the city. This is why it sank mostly-intact into an air pocket rather than being trashed completely (though the outermost areas were out of luck, having been established after the shield system and were thus beyond its border). It was also called into service to protect the city from a volcanic eruption, and showed the ability to harden and crumble the magma that covered it. Star Wars canon has two kinds of shields — "energy" shields (a.k.a. ray shields) to repel energy blasts, and "particle" shields to repel physical objects. Shields consume a massive amount of energy, though, so if you're shielding something the size of a planet, you generally can only have one. This makes perfect sense in canon, but a systematic failure to explain it at any point in the movies left entire audiences going "What the hell?" when droids casually strolled through the shield that had just repelled tank fire in The Phantom Menace. The confusion, and the length of the above explanation, also explain why so many writers prefer to just make their shields magical barriers that just work. The design of Coruscant's shields were two layers of energy/particle shields composed of hexagonal sections. At any given time both layers would have some number of open hexagons so the constant space traffic could continue while leaving the planet absurdly well protected. This makes Coruscant almost impervious to direct attack... as long as the shields can remain up. The energy requirements are astronomical, though, which has been a factor every time Coruscant is successfully invaded. The efficacy of this system fluctuates Depending on the Writer. Star Wars ship shields seem relatively effective on larger ships (anything from the size of the Millenium Falcon up) but strangely useless on fighters. The rebel fighters (X-wings et al) have deflector shields which supposedly gives them an advantage over the unshielded TIE fighters the Empire uses but in practice X-wings are just as vulnerable. While Luke survives a couple of hits in his X-wing, neither of them hit a vital area and the single hit Wedge takes damages his ship to the point he has to pull out of the trench run. This is averted in most video game adaptations though — rebel fighters have effective shields in those. Rogue One give us a closer look at a full planetary shield with the one around Scarif. It surrounds the planet with only one orbital station used as door to allow ship traffic. Several X-wings manage to slip past to attack the forces on the ground before the shield door is closed, but when it does a pair of fighters can't recover in time and smashes against it. The shield also stops transmissions (except for minimal ones using a dedicated imperial channel), which is why the Rebels need to destroy the orbital station and bring down the shield before the Rogue One team on Scarif can transmit the Death Star plans to the ships above. The invading alien armada from Independence Day have energy shields so potent they can shrug off nuclear weapons without a scratch. Humanity ultimately wins by uploading a computer virus to the mothership that disables the shields, then nuking the mothership before they can correct the problem. Without the shields, the alien fighters are more or less on par with the human fighters, although they still have a numbers advantage. In the 1984 Dune movie, the entire complex at Arrakeen is protected by a single enormous wall-shaped Shield. Gotta wonder how vulnerable that made the complex to lasgun fire. In the Dune universe, shields struck with lasguns produces a nuclear explosion (at both the shield end and the lasgun end) and nuclear weapons are forbidden at the cost of having all the Great Houses turn against you and the Spacing Guild revoke your ability to travel. Harry Potter and the Deathly Hallows, Part 2. OK, it's a magical defense, but it looks like a shield and acts like a shield, especially when thousands of Death Eaters start firing indirect-fire curses at Hogwarts. Most film versions of The War of the Worlds have the alien tripods protected by energy shields, an update to the story that is necessary to protect them from modern weaponry. In the original, the tripods were well-armored, but conventional artillery could still destroy them with concentrated fire as could naval gunfire. Earth has one in the Men in Black movies as a result of a donation from a refugee; the third movie is about its construction. One wonders how the Arquillians managed to get around it in the first film. It would explain why no-one but J takes the threat particularly seriously; they never actually managed more than a warning shot. 12 to the Moon (1960) has the astronauts setting up portable "magnetic meteorite deflectors". Let's hope any incoming rocks consist of ferrous material. Passengers (2016): The Avalon is equipped with these to prevent asteroid and meteor strikes, though we see them weakening at the beginning. It turns out that some got through, damaging the ship very seriously. Avengers: Infinity War: A huge dome-shaped energy shield protects the Wakanda capital against the assault from Thanos's forces. One of the Drop Ships trying to crash through it is utterly destroyed. It later contains the immense flow of Outriders, but the continuous pressure by the alien mooks allow a few to pierce through. Once the heroes understand they're at risk of being flanked, Black Panther orders a section of the shield to be opened to direct their attack where there are troops ready to fight them. Frank Herbert's Dune had both personal and ship-sized force fields that were good against fast-moving objects, but could be penetrated by slow-moving ones, could be brought down with a sufficient overload, and which exploded violently if struck by a laser — and so did the laser, so it wasn't a useful offensive effect unless the shooter was suicidal or used an automated gun. Which still isn't terribly helpful as it would immediately incur the wrath of the Great Houses for using nuclear-like weapons and the Spacing Guild revokes your ability to travel. An interesting effect of the lasgun/shield interaction in Dune is that the explosive power is random: a weak lasgun and shield may produce a giant explosion while a strong lasgun and shield may only destroy themselves. Used to great tactical advantage in the later books, where unmanned shield projectors were placed on the battlefield as booby traps. Anyway, the whole point of having the shields work that way was so that we could still have sword fights in a laser-gun-technology society. Hence the special fighting style where thin blades are slowed just before contact. They were also dangerous to use on Arrakis, as the shield oscillations drove Sand Worms into a frenzy. The Mote in God's Eye has one called the Langston Field, but Larry Niven and Jerry Pournelle go into minute detail about how it works in a story collected in N-space. This includes them claiming that they came up with how that technology worked and then wrote the story around those limitations. Gets around the above-mentioned Newtonian problem by draining energy from anything incoming. Energy beams are weakened, and projectiles lose kinetic energy and slow down. (Note that this makes the Field a zone around the ship rather than a thin bubble or wall.) The Field absorbs the drained energy, then gradually radiates it outward as heat—unless it absorbs too much energy, in which case it collapses, radiating all the stored energy inward and outward at once, destroying the shielded ship. Appears in Neal Asher's The Polity novels, where they are called "Hard Fields". Unlike most representations of Force Fields, hard fields do not protect against physical force without cost, but instead transfer all the force to the shield generator- hopefully located well away from whatever the field is protecting. Your basic garden-variety "conventional" shield, which effectively acts as an invisible wall — the safest type to use if you're worried about civilians walking right into it. "High-energy" shields which differ from the above by, aside from having more stopping power, also extending into the fifth dimension, thereby preventing inconvenient teleporters or fusion bombs delivered by the ubiquitous transform cannons from simply popping into existence right inside your ship. And the paratron shield, which effectively displaces everything hitting it into hyperspace. Since hyperspace in this setting isn't a place where unprotected objects can exist for long, this generally means that such things either end up in a random alternate universe with usually no way back (if they're lucky) or cease to be altogether. Most of these shields follow the above rules—they can be broken down by concentrated fire, often from several attackers combining their efforts, and ships running out of energy—rarely though that happens—are in major problems. However, on occasion there are also shields that in normal deployment use very little energy and drain all further energy from the attacks they're shielding against, meaning that you only strengthen the shields with prolonged attacks. As a final point, the series also features literal "deflector fields"... which actually aren't this trope at all, but rather Cloaking Devices working for the most part in the visible spectrum (they get their name from the way they 'deflect' light around who- or whatever wants to remain invisible). They're seen most often on the personal scale, but can in principle be used to hide larger objects as well; it's just not normally worth the bother because somebody actively looking for those will likely not rely on optical sensors alone anyway and the energy of the field itself is quite detectable. Also from the mind of Larry Niven: his Known Space series features a "stasis field" — though not technically a "deflector", since it was a field in which no time passes — that can be used for everything from creating a knife (his "variable-sword" is a monofilament cord encased in a stasis field) — to shielding a ship or spacesuit (see World of Ptavvs). Larry Niven himself once stated that it got to the point where he had to find reasons not to use a stasis field as a solution for everything. The "shields" (referred to as "walls" and "bands" in the novels) actually have a logical basis, given the way they are described to work. The ships have gravity drives; the effect of the drives manifests itself on the "top" and the "bottom" of the ships (called "bands" to differentiate them from the other "walls") — where the effect is impenetrable. All ships above pinnace size also have "sidewalls" — also areas of focused gravity, though not as strong as the top or bottom walls. A strong enough energy blast can penetrate the sidewalls, though with distortion and a lessening of power — the bows and sterns of the ships are unshielded. Or at least were, until the protagonist's star nation develops "bow-walls". Tactics involves using enough missiles to get past the defenses of the opposing ships and letting loose with nuclear-bomb-pumped lasers. This is all a complicated rationale to have Napoleonic style fleet battles IN SPACE!. There are also particle shields, which are just what they sound like: energy fields to deflect particles when traveling at relativistic speeds. Civilian grade particle shielding can protect a ship up to .6c, while military grade shielding protects up to .8c. These are generated by the drive systems, so missiles that go ballistic when their drives are out (they either burn out or idle for a while to extend range) can be destroyed by debris and dust if left to coast for too long. Shields in David Weber's Empire from the Ashes trilogy can block things traveling in hyperspace (like hypermissiles), but hyperspace consists of multiple "bands" that the overall shield strength (a huge energy drain) must be distributed among. Imperial shields consist of one or two solid layers that encompass the ship; if a layer pops, though, the entire ship becomes completely vulnerable. The Achuultani use a number of interlocking and overlapping discs, trading overall strength for redundancy. Force fields exist in the Eric Nylund novel A Game of Universe, but they don't seem to be widely used: they've got something better. This is a Magitek universe, so starships have "protective circles": Geometric Magic instead of shields. They still work the same, with the protective circle being drained by attacks and having to be recharged (somehow) over time. In the Tomorrow War (rather "hard" 'verse) by Alexander Zorich, shields are useful against rays, but not kinetic weapons, which of course makes latter just better. Attempts to strap shields on a aerospace fighter the first time was one of the first book's plot lines, mainly on account of trying to make it work in an atmosphere — apparently, it was "solid" enough to mess up aerodynamics, but not enough to be used as a Hard Light element. The Bolo series gives the title supertanks "Battlescreens". Being military sci-fi, their effects are quite important and are gone into at length: they stop physical impacts cold, destroying the projectiles, but can only weaken energy weapons, drawing off some of the beam power to top up the Bolo's own energy reserves. Various minor details suggest they are actually extremely powerful magnetic fields. The "Stasis Field". Only problem is that nothing inside can go faster than 16.3 m/s, rendering most projectile and ray weapons useless, and any living thing not wearing special armor dies instantly when inside of it. Which means that inside of the field, it's a Sword Fight. See also the double-layer spacedust repelling field the ships use to enable them to move at relativistic speeds without having to worry about running into much. The "Heart of Gold" out of The Hitchhiker's Guide to the Galaxy books has a shield at least one inch thick. A Vogon attack with a dozen 30-megahurt cannon just pounds away at it, presumably trying to get through via brute force. Verner Vinge's Across Realtime books involve a technology akin to Larry Niven's stasis field, called a bobble, which creates a spherical area of stopped time. While the bobble is active, anything inside it is completely unaffected by anything that may happen in the outside universe. The consequences of this technology are essentially the plot of the novels. In the Wild Cards series The Amazing Bubbles absorbs energy and stores it in her body as fat. She can then release it through bubbles at extremely high velocities. This power makes her Nigh Invulnerable, even to the extent of absorbing a nuclear blast, though she ends up comatose and massively overweight for a long time as a result. In Dragonriders of Pern at least big colony ships has shields elastic and — large — enough to bounce away objects at typical meteor speed without turning them to fine dust. However, they have destructive mode as well, just set in deflection mode as more resource saving and obviously safer for shuttles. Spacecraft in E. E. Doc Smith's Lensman universe were protected by "Battle Screens" that glowed with higher and higher colors of blackbody radiation as they absorbed energy, turning black when they were at last overcome. There were personal shields too. Like the shields in Dune, their resistance increased in proportion to the velocity of the impinging object, which was why Valerian space axes were so common (at the end of Galactic Patrol, Kinnison overcame the Big Bad's shields by using a machine gun that fired heavy, relatively low-speed bullets). An important point of difference from TV shows such as Star Trek is that Lensman universe ships usually have at least two layers of shields, PLUS a further layer more or less integral with the outer skin of the ship ("wall-shield"), which is tougher than the others. There is also a separate meteorite screen, which is basically a globular tractor beam with polarity reversed, but its usefulness against deliberate attack is essentially zero. Necroscope: never being ones to think small, Russia attempts to blanket the entire (then) Soviet Union with one of these. Sadly all it does is create an inter-dimensional superhighway to the source world of Vampirism. Oops! "Breeds There A Man...? ": The large-scale shield reflects light instead of being transparent. "Victory Unintentional": The ZZ robots have been sent to meet the Jovians for a face-to-face meeting. Their objective? To discover if the Jovians have developed force field technology. Once the Jovians demonstrate the technology, the robots somberly return to their ship to report the bad news to their human masters. In Robert Westall's Urn Burial, both alien races encountered have deflector shields of differing levels of advancement. One race's are of the barely-visible kind and the others create a mirror effect. In The Chronicles of Professor Jack Baling a personal one is used at the end of the first episode to defend against Jack's death ray. It's "about the size of a fold-up highway map and the color of Windex." In Raise the Titanic!, the Pentagon is developing "The Sicilian Project", which aims to use sound waves to deflect nuclear missiles. The drawback is that it runs on a mineral called Byzantium which is either A) Ridiculously inaccessible to mine, B) Already mined by the USSR, or C) Mined decades ago and then sunk with the RMS Titanic. In Animorphs, The Secret, the Yeerks have one of these around their logging project. The kids morph termites to try and dig under it, which brings its own problems. The Star Carrier series' shield technology relies on manipulation of spacetime to bend incoming ordnance back in on itself. This destroys missiles outright and deflects kinetic and beam weapons. The author also recognizes that an effective deflector shield also makes for a decent cloaking device: the shields also block light, and must be dropped to return fire or send and receive transmissions. This means that ships under heavy enough fire can't shoot back, nor can they radio for help or give orders. Most starships in Mikhail Akhmanov's Arrivals from the Dark books have shields. In fact, ships without shields might as well be made of tissue paper, given the sort of energies involved in space combat. The first novel still has human ships unshielded, as it takes place in the pre-FTL days. The first contact between a human cruiser and the enormous Faata starship has the cruiser arriving to the area of a strange gamma-burst and not find anything, since the Faata ship's shields also act as a cloaking device to the primitive human sensors. When the Faata use a Tractor Beam on the cruiser, the human captain panics and orders a blind strike with the cruiser's "swarms" (a shotgun-like burst of magnetically-accelerated icicles). The Faata shields not only deflect, but reflect the burst back at the cruiser, shredding the ship. Later, an attempt by twelve human cruisers to keep the alien starship from reaching Earth is a Curb-Stomp Battle in large part due to the presence of shields on the starship, as the twelve cruisers fire off a nuclear Macross Missile Massacre (roughly 140 gigaton in total), which the starship's shields absorb without even a Star Trek Shake. The Faata anti-matter weapons make short work of the human fleet. In Invasion of Kzarch, both the marine battlesuits and the pirates' spaceships and gunboats mount shields. "A few minutes would suffice to surround our island with a stream of free aethernote meaning luminiferous aether, the postulated medium for the propagation of light in late-19th century science. . No solid body can pass through this stream, it would be whirled away, dissolved into atoms. Shells and armoured ships vanish in it like a straw in a flame." The Nihilite armour used by the Martians in Laßwitz' Auf zwei Planeten (1897) is very much like this in effect, but works by chemical reaction. The Gaunt's Ghosts novel series uses this trope quite frequently, which is not surprising as it is set in the Warhammer 40,000 universe. Void shields show up in The Guns of Tanith and Sagittar Slaith has a las-proof personal shield. The status of the shield covering Vervunhive becomes an issue twice in Necropolis. Obviously, they play an important role in a few space battles described throughout the series. In The Cinder Spires, airships have "shrouds", a kind of cloud of etheric energy that can absorb and dissipate etheric attacks. However, each hit burns away part of the shroud and it takes time for these holes to fill back in. In addition, shrouds can't be projected far enough from a ship's hull to cover the ethersails at their full extent, so a ship in combat has to choose between leaving their ethersails vulnerable to enemy fire or curtailing their own speed and maneuverability. Dire, of The Dire Saga, has a personal force field. Unfortunately, it only works on fast-moving items and it drains a lot of power with each use. Aeon 14 has three different technologies used by starships for shielding. The colony ship Intrepid starts out with ES shields, which are essentially electromagnetic interference capable of screening out hard radiation and directed energy weapons. After they're time-dilated into the 9th millennium, they encounter ships with gravitic shields, which use Artificial Gravity to destroy threats. Intrepid then combines 9th millennium gravitic technology with its own, and creates stasis shields, which can allow one-man Space Fighters to stand up to gravitically shielded dreadnoughts for a time. The "Air-Clog" is a shield generated by running the Earth-Current through a circular conductor surrounding the Last Redoubt in William Hope Hodgson's The Night Land. Given that The Night Land was published in 1912, this may be the first fully realized description of a technology-based force field in all of literature. Star Trek has lots of shields and force fields. On Star Trek: Enterprise, we even get to watch these get invented. Enterprise (NX-01) herself did not have shields (except in a Flash Forward), but appears to have had some kind of "navigational deflector" to avoid being pierced by space dust. NX-01 Enterprise instead has "polarized hull plating" which, though it was routinely charged before a battle, proved almost useless against advanced energy weapons. One wonders just how flimsy their hull would be without its hull plating polarized. According to Treknobabble, the solidity of holograms in the Trek Verse is the result of their being surrounded by a highly specialized force field. The abundance of Tim Taylor Technology coupled with the availability of force fields has led some to theorize that, in fact, all Federation technology is held together by tiny force fields. The navigational deflector has been a canonical part of Trek since Star Trek: The Original Series, and explains why the ship isn't flayed apart when going exponentially faster than light. It was just never properly mentioned until a certain famous episode in The Next Generation, but ever since then, it stopped being a deflector and became a general-purpose power emitter. You can use it to blast things, hold open or close rips in time, jump-start somebody else's ship, or hell, maybe punch open wormholes for all we know. 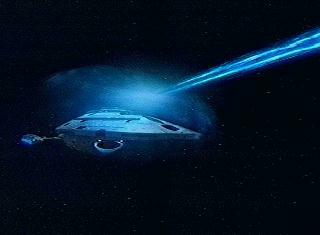 Voyager briefly goes to low warp with the navigational deflector offline in the episode 'Year Of Hell' and takes damage as a result. "The Outrageous Okona" from The Next Generation features a scene where Worf and Picard react with incredulity at a primitive ship locking lasers on them. Turns out that ship's power generation is so low that her lasers can't even penetrate the Enterprise-D's navigational shields, let alone the main shields. The novel Federation features a wonderful interplay of cloaking, shields, antimatter containment fields, and Captain Picard that results in Picard taking out a Romulan ship by flying the Enterprise through it, sustaining almost no damage, and watching as the Romulans suddenly stop being there. Almost every ship also has a structural integrity field, which holds the ships's structure together, necessitated by the size of some of the larger ships and also to minimize structural stress from acceleration and damage. This, however, qualifies not as a Deflector Shield but as a Reinforce Field. Harry Kim: Can we go to low warp? Tom Paris: The ship might make it without inertial dampeners but we'll all be stains on the back wall. Blake's 7. The Liberator is protected by a "force wall" against plasma bolts, meteor storms, or even tiny particles of dust if they're going fast enough. However it's very energy consumptive; in "Duel" the Liberator's power banks are so low they can only raise the force wall just before the plasma bolt strikes. There's also a flare shield that must be raised before firing the neutron blasters, apparently to stop the crew being injured by reflected glare and radiation from their own weapons. The force wall was one of several superior technologies that made the Liberator quite a battlewagon — in "The Harvest of Kairos" Servalan is shocked that the Liberator can fire through its own force wall, and has the ability to overlap its force walls for greater protection. There were several mentions of defense fields and screens used to protect spaceships or surface installations, so the Federation apparently has similar albeit less advanced technology. Farscape: Energy barriers are rare in the Farscape 'verse, but they do exist. Our heroes salvage one in "PK Tech Girl", though it breaks the very next time they use it. Stargate SG-1: Most spacefaring races have defensive shields for large ships, and these vary greatly in quality from race to race. Note that there is also a distinction drawn in one episode between starship force fields that work like those on Star Trek (repel everything indiscriminately) and smaller personal shields that work like those on Dune (let slow-moving objects through); both exist in the Stargate universe. Also, Goa'uld ships use force fields instead of glass for windows. One thing about Goa'uld forcefields (that was pretty much always portrayed with continuity) is that they are one-way. Thus, they stop all attacks coming from the outside, but don't impede firing from the inside or launching smaller ships, with no need to open dangerous holes in the shield. One episode has Jack, Sam, and Daniel acquire armbands that grant them Super Strength and Super Speed. They use them to get into a planetary shipyard in the process of constructing Apophis's new mothership. Since they're able to move extremely fast, they can perceive the frequency at which the force fields in the base cycle and pass through when they're not there. Stargate Atlantis: The Ancients have a force field around an entire city. The shield is unique in the series in that it does not degrade as it takes damage and the amount of power it consumes is proportional to the strain it is under; if it is not under any strain it can stay active indefinitely. The shield, coupled with a sufficient power source has been shown to resist: orbital bombardment from the entire Wraith fleet, water pressure from the bottom of the ocean (hence the legend of Atlantis sinking beneath the waves) and extended over an entire planet to resist a coronal mass ejection. It can also be modified to act as a cloaking device and Anti-replicator shield. Shields as Star Trek popularized the concept are largely absent but the highly advanced aliens from Thirdspace have them; it doesn't make them invincible but it makes them capable of withstanding several orders of magnitude more firepower than the other races. A handful of their fighters are devastating as their shields largely protect them while they fling energy blasts as big as the fighter itself. A single Starfury is shown being unable to punch through the shield in the time it takes one of the fighters to aim and shoot it. We also see a White Star going one on one with one of the fighters; it has an easier time than a single Starfury and kills the fighter, but takes heavy damage in the tradeoff. The gate to Thirdspace is also shielded once its powered up. While it can eat the firepower of the entire fleet assembled to defend against the aliens, it, too, has limits. Captain Sheridan is able to sneak aboard carrying a nuke when the shield lowers in back to strengthen the front. The Vorlon too have shields for their larger ships, allowing them to shrug off attacks from the Younger Races and tank even ones from the Shadows, First Ones like the Vorlon themselves. The White Stars, built by the Minbari but including Vorlon technology, have shields too. They are however a lot less effective, as the Vorlon technology transfer did not include their advanced power sources. The Abbai have proper deflector shields for their ships, based on Artificial Gravity. Abbai technology isn't really anything special in most regards, but their entire military mindset is based on defense rather than offense, so they're ahead of the curve in this regard-as shown by races with more advanced artificial gravity technology (such as the Hyach, the Centauri, the Minbari, and even the Brakiri, that have the most advanced artificial gravity among the Younger Races) having failed to develop shields. Some time after the series the Minbari started building ships equipped with shields. While not confirmed, it's implied they managed to reverse-engineer it from the Vorlon-designed shield generators for the White Stars. Human military ships have the E-Web, a weak shield that softens, rather than fully block, enemy attacks. This one is actually seen on-screen early during the Earth Alliance Civil War, when the rebelling Agamemnon is being chased by a loyalist EarthForce ship of the same class and tanks a heavy laser from them-then the XO of the Agamemnon mentions that the chasing ship has deactivated its E-Web defenses to launch fighters, and a single shot from their heavy laser blows up the pursuer. In Expanded Universe, the Technomages are able to create energy shields. Jason Ironheart is able to generate powerful telekinetic shields before ascending into an Energy Being. He even gives Talia a Just Think of the Potential speech (including protecting ships and important people with telekinetic shields) before pointing out that Psi Corps only wanted to create telekinetic assassins. In the serial "The Invasion of Time", the planet Gallifrey is shown to have a large force field protecting it from being attacked. The "tribophysical waveform macro kinetic extrapolator" introduced in "Boom Town" and used by Captain Jack Harkness to shield the TARDIS from Dalek missiles. Apparently, it can shield a single person from an Earth-Shattering Kaboom and ride the shockwave to another planet. Silversun's Star Runner is equipped with these - less for combat and more for protection against adverse conditions or space debris, as it is an unarmed civilian ship. They are mentioned early in the series when Star Runner passes through a Solar Fog, then seen outright preventing an asteroid impact in the Sargasso Disc. They are also mentioned as suffering "nominal silting" when pursuing the Infinity. Attack from Mars: The Martian's ships are equipped with force fields, and the player must disable them to start a City Mode. Martian: You cannot defeat our force field! Big Guns: The Queen's military have a force field (represented by the pop-up post between the flippers) that prevent the ball from draining between the flippers. Almost every sci-fi fleet summoned in Destroy the Godmodder is equipped with some kind of energy shield, though occasionally some intentionally hard-sci fi entities eschew them. The accompanying literature mentions "Gellar fields", which are used by Imperial ships to protect themselves while travelling through the Warp (an alternate dimension which allows travel over great distances, but which also happens to essentially be the 40K version of Hell), in order to prevent their ships getting infested with/torn apart by malevolent (or in some cases just plain bored) daemons/damned souls. It's never well mentioned how other races such as the Orks and the Eldar manage to prevent this kind of occurrence, although the fact that the Eldar essentially built roads through the Warp might have something to do with their particular race's habit of escaping death by daemon. Orks tend either not to care, and find a daemonic invasion entertaining, or to use a Clap Your Hands Ifyou Believe psychic effect to repel them. Starships of most races also have void-shields which deflect or absorbs incoming damage. Imperial titans and hive cities also have voidshields. Making them very hard to attack even with the huge weapons of the heaviest units in the setting. In Rocket Age, set in the 1930s, the Americans have managed to create a ship scale RAY field that can stop both RAY and kinetic energy. There are also ancient personal deflector shields, created by the Erisians and others, which can occasionally be found. An unlockable ship subsystem in Star Ruler, though not available right from the start. Shields have the advantage of being far, far lighter than conventional ship armor, and will regenerate, whereas only one armor type can regenerate on its own. However, the shields need huge amounts of power to run, and as they run out of shield "health", damage can bypass the shields and hit the ship directly - which could destroy the shield generator, or kill the entire crew. Independence War ships have a given number of Linear Displacement Array (LDA) shields that can each track one target within a limited direction (the usual arrangement is one shield on top and one on the bottom; the rear is uncovered because they would interfere with the engines) and need some time to recharge after taking a hit. They don't block missiles or other physical objects, though there is an aggressor shield variant in Independence War 2 that can be used for ramming attacks. Because of these limitations, you can't really rely on them instead of dodging every shot that comes your way, but a few blocked PBC projectiles may very well make the difference between life and death. Anything built by the Protoss comes with a deflective shield that wears off after absorbing a certain amount of damage; although these shields slowly regenerate over time, the player can use Shield Batteries for a quick recharge. The Terrans also have a special skill, the Defensive Matrix, that surrounds a unit in a mostly impenetrable shield (the unit still takes a little bit of damage). Also lampshaded when the commander of a Terran battlecruiser (a powerful yet unshielded warship) says: "Shields up, weapons online!" — only to correct himself when clicked again — "... not equipped with shields? Well then, buckle up!" Terran Science Vessels can buff units with a Defense Matrix, a powerful yet temporary shield. Throwing one of these on a Protoss unit can make it practically invulnerable for about a minute. In II, the Protoss lost the Shield Battery, so no more sort-of healing. Their new unit, the Immortal, gets special hardened shields that reduce high-damage attacks like artillery (as long as they still have shields). Unfortunately, this leaves them open to Death of a Thousand Cuts, especially by the Zerg. Heavy-duty force fields, of both Prothean and geth vis-a-vis Reaper origin, pop up throughout the game. An amusing interlude occurs when you first find Liara, who has managed to get herself locked inside a Prothean force-field bubble while trying to avoid a small army of geth and krogan mercenaries. Starship-scaled Kinetic Barriers are far more common applications of the large-scale version. They allow deflection of debris and mass accelerator rounds, but only up to a certain point. As their name also implies, they're kinetic barriers; laser-based weaponry can bypass them completely but has yet to be developed beyond defensive weaponry. In the second game, you can improve the Normandy with a new type of kinetic barrier that significantly improves the damage absorption by jerking the incoming object (be it a kinetic round or a huge piece of debris) sideways to decrease the force impacting the barrier. The Covenant in the Halo series use energy shields for all sorts of things, including to cover their massive starships. The humans managed to eventually reverse-engineer this technology for their own ships and vehicles. In the Expanded Universe, deactivating a certain part of a Covenant ship's shields is handy for infiltrating said ship. For example, a common boarding strategy is to blast the shields, then blast the newly exposed ship, destroying that section's shield generator. The Spartans then fly in through the shield hole, and find an opening. The first game has shields substracting their level from damage dealt by each weapon. The series as a whole has the standard deflector shield technology that you can research for your starships, but also lets you build artificial magnetic fields for irradiated planets. Of course you can later upgrade those into full-blown planetary deflector shields. In Master of Orion 2 ship design allows devices buffing shield properties, like "Hard Shields" (resists shield-piercing weapons and nebulae, increases level), "Shield Capacitors" (increases recharge rate between combat turns), and "Multiphased Shields" (50% greater shield strength). The shields are segmented into 4 arcs and each turn they regenerate an amount based on the strongest arc, though enveloping weapons hit all four at once. There's also "Personal Shield" technology that gives major bonus in ground combat and boarding. Exotic technologies include "Damper Field", which replaces standard deflector shields with an energy field that reduces any incoming damage by 75% and has 50% chance to kill teleporting boarders. "Reflector Field" is compatible both with shields and Damper Field and gives a chance to reflect weapons fire back at the shooter. The Wild ARMs RPG series features the golem Asgard who seems to specialize in deflector shields. Notably, its shields completely disintegrate anything that touches them when they're on. In the original game, the characters realized that this meant that the golem who supposedly had the Ultimate Defense also had the Ultimate Offense and used the golem to break through another force field around the enemies' base. Later games simply took it for granted that Asgard would be attacking with moves like Barrier Fist and whatnot, and Wild Arms XF gave Asgard the ability Barrier Storm, which instantly killed anyone standing next to it by doing more damage than your maximum HP. Star Ocean: Till the End of Time explains ship-based deflector shields has shunting energy to a theoretical dimension based on imaginary numbers. Shields feature prominently in Supreme Commander, where they were originally reverse-engineered from an alien race by the Aeon, then stolen and copied by the UEF and Cybran Nation. All three factions have powerful stationary shield generators that project a spherical shield around their area. They can all upgrade them a little, with the UEF beating the other two by being able to get up to level seven, and having an "artillery shield roughly four times the size of even that. The Aeon take things a step further with a number of units sporting personal shield generators that conform over the unit. The UEF also gets in on the personal shield idea with their siege bot and Fatboy-class Military Mashup Machine, then adding in a naval-based shield generator in Forged Alliance. The sneaky Cybrans only use shields in stationary defensive installations. In the old video game Scorched Earth, in addition to normal energy shields, you could use a literal Deflector Shield which would deflect missiles off course from your tank. Since the Two Cities update to Team Fortress 2, the Medic can, in Mann vs. Machine mode, upgrade his Medigun to create one of these after building up enough energy from healing teammates. Said shield blocks all robot attacks, bullets and otherwise, while allowing his team to shoot from safety. It also damages robots that touch it, but they can still walk through it. Magical force fields protect Ganondorf's castle in The Legend of Zelda: Ocarina of Time. The only way to get by them is by destroying their corresponding core. The trope started with Zelda II: The Adventure of Link, in which the final temple was sealed by a magic barrier that wouldn't lower until you had cleared all the other temples. The Legend of Zelda: Twilight Princess also has energy barriers, generated by twilight realm beasts. In certain battles, they prevent you from leaving the Mini-Boss arena until you defeat all the creatures attacking you. Sometimes they make it impossible to actually defeat them all at once, requiring that you defeat the out-of-the-way one before taking on the remaining two. The Legend of Zelda: A Link to the Past also had an energy barrier protecting the door to the lair of Agahnim (either Ganondorf in disguise, or a part of him, or just The Dragon), for which the Master Sword was needed to break. In The Legend of Zelda: The Wind Waker, the pathway leading to Ganon's tower was blocked by an invisible wall of energy that could only be broken by the fully restored Master Sword. Similarly, Final Fantasy V has Exdeath's Castle protected by barrier towers. Using slightly more common sense than usual, you only need to shut off one of them to shut down the barrier, not all. Final Fantasy XII's cities are protected by a "Paling," a magick force field projected by a massive crystal in the center of town, that lets travelers pass through but keeps hostile creatures (or attacks) outside. Once the Paling falls, the city becomes vulnerable to assault and invasion —or the stray airship that was just shot out of the sky. Final Fantasy Type-0 is continuing to up the ante, this time with a shield that protects an entire country. Naturally, the barrier generator (a crystal, of course) shatters, kicking off the main plot. In Final Fantasy VIII, Lunatic Pandora is protected by a massive energy field... which is promptly pierced by the Ragnarok ramming it. In Final Fantasy VII, the Northern Crater is engulfed by an energy dome that repels any attempt to break in (the Highwind even bounces off violently if you fly into it). It's brought down by a titanic shot of Mako from the transplanted Sister Ray. Final Fantasy X's Sin can protect itself with a gigantic spherical force field, which is effective enough to repel, overload, and destroy the Al-Bhed Wave Motion Guns and then expand to disintegrate anything in the vicinity. Strangely enough, Sin fails to use this shield when engaging the party and their airship —though it may have been holding back willingly at that point. Pretty sure that's what the whole "Have everyone on the planet sing the Hymn of the Fayth" thing was for, what with Jecht liking the melody so much that it pacified Sin to an extent. In Final Fantasy XIV, the Garleans love to deploy Magitek Barriers to keep out those nasty, nasty magic-using savages of Eorzea. Both the main story of A Realm Reborn and Stormblood have our heroes being forced to shut down these barriers somehow to get to a critical goal. A common feature in the universe of Beyond Good & Evil. There are both large deflector shields, designed to protect buildings from airborne attacks from the Alien Invasion, and smaller, personal shields used by both good and evil soldiers to prevent you from damaging them. Deflector shields, both ship-mounted and man (animal?) portable versions, occur frequently throughout the Star Fox game series. In Star Fox Adventures, there are two mazes involving force fields, which basically behave like near-invisible walls (there's a little sparkle to them). One is found in a room after you activate the Quake Pad in the center, and the force field makes up the inner walls of the maze. Your challenge is to get to the exit before time runs out. Another maze also has regular walls, but force fields block your way to the end when you activate the Quake Pad. You have to turn off each one at a switch or by shooting a Blast Board, and most switches are blocked somehow. Again, a timed challenge. Also, floating robots commonly have shields. The ones in Dragon Rock require you to use an Earthwalker horn to disable the generators, and the one in the Krazoa Palace has the unusual disabling method of shooting colored gems through color-changing flames. In Star Fox Zero the Granby has a new shield that it uses in response to the Wave Motion Gun on Pepper's flagship, preventing the weapon from having any effect. However, the Granby cannot fire through its own shield, so it must open small holes in the shield to fire its lasers through. The player has to slip inside these holes and disable the shield before the ship can be destroyed. Sections of Metroid Prime are sealed off with force fields, especially when it comes to the research stations and the Phazon Mines. Most disabling is accomplished by scanning somewhere, but one goes down when a Phazon Elite punches it. Some fields are used to reinforce the glass walls of the Metroid cages. This allows the Pirates to study the Metroid while still being protected from the monstrous life-sucking jellyfish alien. Once you cut the power, however, they start breaking through the glass to attack both you and the Pirates. This happens in all the Metroid Prime Trilogy games. The World Ends with You has invisible walls that cut you off from certain paths. Some can be disabled by meeting a Reaper's condition; others are just erected, and no condition will satisfy. In Wing Commander, energy shielding is a regular part of space combat, though unlike many other universes shielding hasn't been miniaturized enough to protect personnel. There's a constant struggle between shields and weapons to penetrate them, with some games having shields impenetrable by anything other than a special torpedo on the larger warships, while other games allow any weapon to cause damage. This is averted in the capital warship game of Wing Commander Arena, where the players are flying fighters that are either attacking or defending huge battlecruisers that have massive amounts of armor, but no shielding to free up energy for their guns. EVE Online has these on all ships. The Caldari and some Minmatar ships, rely on shields as their primary means of defense (as opposed to the Gallente and Amarr, who rely chiefly on armor plating). In Sins of a Solar Empire, most ships have this, with absence being the exception. The Vasari have phase missiles that have a chance of bypassing shields and striking armor. The Terran and Vasudan ships initially have no deflector shields, and the shielded Shivan fighters are nigh-invulnerable to their weapons. Fortunately, observation of Shivan technology allows the good guys to develop both shields and more effective weapons in short order. However, shields do not work in subspace, and the Shivans share this disadvantage. But it comes up exactly once in the entire single player campaign, so it's not something that can be counted on. The Shivan Destroyer Lucifer takes this Up to Eleven. Not only is it the only Destroyer-class warship ever to be equipped with shields, but it's also completely invulnerable against all forms of weaponry. In Air Rivals, all player-piloted craft have a passive version that basically just gives more Hit Points. There is also a class-specific version that temporarily blocks all damage from missiles, bombs, and rockets. In Vega Strike, "GraviElectroMagnetic" shields are necessary for any ship, and consume lots of energy, setting the low limit for reactor power. Segmented into 2,4 or 8 sectors depending on the ship, station or turret type. The main limitation is that shields are disabled by activation of either spatial distortion drive, jump drive or cloak. However, many weapons (including all kinetics and otherwise weak lasers) can partially bypass shields. In the turn-based strategy game Cyber Storm, both HERCs and Cybrids mounted energy shields. An active shield would stop projectiles entirely, but could be defeated with directed energy weapons, notably EMP-based systems. The Enclave apparently has access to "Photonic Resonance Barriers" in Fallout 3, which they use to block Project Purity and obstruct LIBERTY PRIME during the final mission. "Probability of mission hindrance: ZERO PERCENT!" Shields are a major branch of research; ships with a "shield" section get a rechargeable bonus to their health. The Liir and Morrigi are experts in their use, while Hivers and Zuul usually have less than 20% chance of getting even the most basic of shielding. It should be noted that it may not always be the best solution, as a shield/deflector generator takes up a full third of the ship, making it impossible to place weapons on the front of a shielded ship. There are also several different variations of shields. Deflectors create a forward-facing hemisphere that blocks almost any ballistic and missile weapon. Disruptor shields are the reverse — they create a hemisphere that blocks any energy weapon. Torpedoes are stopped by both deflectors and disruptor shields. Standard shields completely envelop the ship and protect against most types of attack but can be overloaded by too much damage (unlike deflectors and disruptor shields). There are other types of shields, including small directed shield projectors, automatically facing the strongest enemy weapon and mounted on heavy weapons hardpoints. Cloaking generators are also in the same research tree, as the principle is similar. In Star Wars: Galactic Battlegrounds, some units come with shielding. Essentially, this doubles their health, and the shields (unlike, in most cases, the actual health) regenerate. Deflector shields are a standard equipment on all small ships. The difference between taking shield damage and hull damage, apart from a loud "CLANNNNNNNGGGGG! ", is that taking hull damage also hurts your weapons and equipment, eventually destroying them. There are also three types of shields which are strong against some types of weapons but weak against others. For example, graviton shields are strong against laser, photon, and pulse weapons but weak against plasma and particle weapons. In Elite games, shields are a necessity. Generators are stackable, not segmented and absorb even collision damage. Super Robot Wars has many, the main ones being Telekinesis Field, which is hard to explain (Basically, it uses the pilot's Psychic Powers to create it), and the Gravity Wall, which erects panels of "hard gravity pockets" which either stops an attack in its tracks, or just takes the edge off of it. Ironically, one of the few beam weapons in the Gundam universe that is canonically designed to bypass beam shielding entirely does not exhibit such behavior in SRW. Used by the aliens in Defense Grid: The Awakening: the Bulwark uses them to protect itself, the Spire uses them to protect other aliens near it, and The Juggernaut (no, not that one) uses them to make you cry. Fortunately, Gun and Cannon towers are super effective against shields. X-COM: Apocalypse has shields for both vehicles and individuals. According to the UFO-paedia, the Sectopod is equipped with an energy shield which is resistant to plasma weapons, and since it is usually encountered lategame when plasma weapons replace laser weapons, this can be a problem. The Grav Shield base facility from UFO Defense and its Terror from the Deep counterpart, the Bombardment Shield. When a UFO attacks a base, the Grav Shield pushes the UFO away to allow the defense arrays to fire a second time. The 2012 reboot initially only had Telekinetic Field, a high-level psionic ability that made all allies in the area of effect 40% harder to hit by enemy attacks. Enemy Within upped the ante with the new Mechtoid enemy being able to project a bubble-like personal shield when Mind-Melded by a Sectoid. This shield functions as extra HP that needs to be shot through in order to hurt the Mechtoid itself, but fully regenerates every time a Sectoid Mind-Melds with the Mechtoid. However, shooting the Sectoid generating the shield not only shuts down the shield instantly, but hurts the Mechtoid too. XCOM2 upped the ante once again with the Shieldbearer enemy, who could deploy shields for all nearby allies at once. Galactic Civilizations 2: Dread Lords and its expansion packs allow you to research and equip your ships with shields. However, while shields are great at protecting against various laser and particle beam weapons they provide very little protection against missiles or mass drivers and have a diminishing return on protection against anything other than beam weapons (The actual formula in game uses the square root of the shield power when hit by missiles or projectiles). You need countermeasures to protect against missiles and armor to protect against projectiles. Star Control has temporary force fields for the Terminators -Yehat warships- (They drain a LOT of energy and go down quick, so you have to time it right), and an energy absorption field (which prevents damage) as the special ability for the Utwig Jugger. A third type of ship, the Avatar used by the Chmmr, is surrounded by three smaller ships which are connected by a series of lasers which destroy any oncoming projectiles. Most vehicles in Battlefield 2142 are equipped with a shield that can destroy rockets and missiles. The shield has to be toggled on manually, lasts for a second or two, and then is inactive as it recharges. It probably doesn't protect vehicles from EMP weapons. Tyrian features recharging energy shields which draw power from the ships generator to recharge; choosing a weak generator can result in a slow recharge and your weapons cutting out. Homeworld: Cataclysm, a game of questionable canonicity, features the Sentinel pods, which can project defensive shields when in groups. In order to form a complete "bubble" over the target, 12 Sentinels are required (the game has a max cap of 24 Sentinels). These shields come in three varieties: green (protects against kinetic weapons), yellow (protects against kinetic and missile weapons), and red (protects against kinetic, missile, and ion weapons). Each level must be researched first. Shield sections disappear when overloaded and take time to regenerate. The shields are of a one-way variety, so the protected ship can still fire its weapons. The Sentinels themselves are unprotected and weak, so it is easier to destroy them rather than the shield. Large objects (e.g. ships) can still pass through the shield. According to the manual, during the testing of the Sentinels, one of them accidentally sliced through a frigate with its shield, destroying it. Unfortunately, the game doesn't allow you to do that. The Homeworld series also features the defense field frigate, which projects a protective energy field for short amounts of time. Its usefulness is debatable though, as it requires a fair bit of micromanagement to actually shield other ships from enemy fire. Perimeter: The eponymous Perimeter is a dome-like force field players can raise over parts of their bases (or whole bases). It's virtually impenetrable to attacks and incinerates everything that trying to pass through but has a very high energy cost. It also has a unique ability to steal enemy buildings - erect a field-generator close to them, raise the field - vois la! In the X-Universe series, shields are the only viable defense—hull is very weak and damage translates to very expensive equipment getting destroyed. Hull defense is significantly upgraded in Albion Prelude, however, to reflect the war situation. That, and making ships more survivable if their shields are down. A strategic aspect in the original Star Raiders. Although a single hit when the shields were down would instantly kill the player, daredevil pilots would engage the Zylons with damaged (flickering) or destroyed shields anyway just to avoid a time-consuming trip to a starbase. In Shin Megami Tensei: Strange Journey, all of the Schwarzwelt Investigation Team Cool Ships —the Red Sprite, the Elve, the Blue Jet, and the Gigantic— are equipped with a so-called "plasma shield." It's never made clear whether it's a shield composed of plasma or one that protects from plasma (seeing how the Schwarzwelt is, itself, surrounded by a plasma wall that disintegrates whatever it touches,) but not only is it explicitly enabled every time the Red Sprite jumps between dimensions within the Schwarzwelt, but presumably it's what keeps demons from tearing the ship to pieces while the Strike Team commandos are on a mission. Space Colony has the Space Defence Shield, which protects against meteor showers and volcanic debris. Project Eden and Descent (1,2 and 3) have shields, but no separate health or armor, meaning the character/player dies when the shield fails. In War Front: Turning Point, one of the Allies' response to Stupid Jetpack Hitler and Soviet Super Science are force field tanks. Starflight allows the player to manually raise or lower shields, if installed. The reason you don't leave shields raised all the time is that doing so may be seen as a hostile gesture, just like having your weapons constantly armed. In End of Nations many units can be equiped with shields that absorb all the damage for a limited amount of hitpoints and time. Also, the Liberation Front class has access to Support Powers that raise completely impenetrable shields on the units within an area for a very short time frame. Capital ships are protected by shields. Larger capital ships take Subsystem Damage before being destroyed. Bomber wings are the usual counter to capital ships, as they fire shield-piercing photon torpedoes. The usual tactic is to send your bombers to take out the target ship's or station's shield generator. The Forces of Corruption expansion adds the Zann Consortium faction with the Vengeance-class frigates, which lack shields of their own but are armed with shield-piercing mass drivers. The Rebels' counterpart to the Imperial Star Destroyer is the Mon Calamari Cruiser, which is weaker overall but doesn't have a shield generator subsystem, meaning its shields have to be brought down the old-fashioned way. Admiral Abkbar's flagship Home One is a unique Mon Calamari Cruiser and does have a shield generator subsystem. Nexus: The Jupiter Incident starts out with primitive Earth ships that don't have any shields. After acquiring the Angelwing, you get shields. All Noah, Gorg, Vardrag, and Ghost ships have shields. Higher-end lasers are able to pierce them (with reduced effect), but lasers are designed to damage subsystems not damage the hull (except Ghost lasers, which are powerful enough to do both). Shields deactivate when scanning or cloaked. The Noah fleet has also developed the Fortress Shield, which is fitted on a Colossus-class support ship and creates a huge shield bubble that protects any ship inside but allows ships inside to fire out. It doesn't prevent enemy from entering the bubble, though, although any normal shield fails inside the bubble. The only way to destroy the Fortress Shield is with the Siege Laser, which can only be mounted on battleships and requires the combined energy of three other ships to fire. Ordinary mass drivers don't do much damage against shields. However, there is a whole branch of "energy shell" type weapons that don't do any physical damage but can overwhelm and collapse shields. Higher-end mass drivers are more effective against shields, but it's still better to use energy shells (using both is taxing on your power generator). Ground Control 2 has city spanning energy shields, unfortunately the enemy has things that can pass straight though them. The shields are mainly there to prevent Orbital Bombardment, but they don't stop the enemy from landing drop pods. In Breath of Fire: Dragon Quarter, all of the end bosses and the Bonus Boss employ this called "Absolute Defense". The damage counter starts off at negative and damage doesn't actually count until it goes past 0. In StarMade you can buy shield generators and put them on your ship, there is no limit except your ships power for the amount of shields you can have. Star Trek Online has personal shields that work in exactly the same way as the ship ones. It averts Regenerating Shield, Static Health though, and both personal health and ship hull strength regenerate as well as shields, although not as quickly. Star Trek: Strategic Operations Simulator gives your simulated ship deflector shields that can take a few hits before they go down and your ship starts to take damage. Docking with a starbase can repair your ship and restore your shields. The Naval Ops series has two flavours of shields for ships: Gravity shields that deflect physical projectiles, and Magnetic shields that deflect lasers. End-game or New Game Plus enemies frequently have one equipped, as can a player ship after enough research or a lucky drop. In the MMOFPS PlanetSide 2, successfully capturing a large base (an Amp Station, a Biolab, or a Tech Plant) will cause the facility's defense system to charge up before activating a large, transparent shield around the base. This is purely cosmetic, though, and does not actually impact gameplay. Ships in FTL: Faster Than Light have shields which block enemy beams and lasers, but not missiles. The Halberd and Glaive beam weapons can pierce one/two layers at reduced damage, respectively and there's a special laser weapon that can bypass one layer of shields, used by the B variant of the rock cruiser. There is also the "Super Shield", mainly used by the Zoltan, which blocks everything such as missiles, crew/bomb teleportation and Mind Control (unless you have a Super Shield Bypass) but it can only take a limited amount of hits before dissipating, ion and beam weapons notably do more damage to it. Borderlands2: In addition to the personal shields carried over from the first game, a plot critical mission has the player fetch a power core for the shield generator that protects the city of Sanctuary. All ships in Star Command have shields, although they work differently for enemy ships compared to the player's ship. For the enemy, they merely act as more armor and do not regenerate. For the player's ship, they are significantly weaker (they go down after just one hit), but they can regenerate. Additionally, active shields block an attempt by the enemy to teleport boarding parties. The only exception is the second mission, where the obsolete Soviet transporter technology is able to bypass modern shields, as they're not designed to block them. Starbase Orion: shields are an ship/starbase equipment that can be researched and used in a design. There are 4 levels of shield research. There are also additional components that improve the shield. Shields normally don't work within a nebula, but a certain component can allow them to function even there. Lasers and plasma turrets deal bonus damage to shields, while Gauss turrets and ion pulse cannons deal reduced damage (Gauss turrets, in fact, are pretty much useless against shields). Unlike armor or structure, shields regenerate during battle. Additionally, ion pulse cannons deal extra damage to structure when hitting an active shield, which can make shields a liability when facing an IPC-armed enemy. Various types of shields are present in Ascendancy. They vary wildly in descriptions and principle, but function basically the same in-game, varying only in strength and the amount of power used up. Shields typically only drain the ship's batteries when struck by enemy fire, except for one low-level passive shield that doesn't drain power at all. Visually, if a ship is struck by a weapon that is completely absorbed by the shield, the effect is only a shield fizzle. If the weapon even partially penetrates the shield, the weapon's explosive effect is shown. Invisible, Inc.: Unique to special K&O guards, they grant the highest armor in the game but can be hacked and deactivated. Star Wars: The Arcade Game: Your X-Wing Fighter can take several hits before its shield is destroyed, with one more hit ending the game. Completing a level with the destruction of the Death Star regenerates the shield by one hit point. In From the Depths, boats and aircraft use multiple planar shields rather than the typical all-encompassing bubble. With the game's heavy Design-It-Yourself Equipment, players place shield emitters, customize the size, angle, and their effectiveness with a corresponding increase in engine power drain. Shields can reflect or deflect incoming missiles and cannon fire, but have no effect on lasers and ramming attacks. Of note is that improperly configured shield arrays can make incoming damage worse at certain angles, as shields can end up funneling ricocheting projectiles to singular points. In Sunrider, both capital ships and certain Ryders can project shields over a large radius. Because shields are so common and they become stronger where two or more shields overlap, they've rendered traditional laser weapons practically useless if you don't have a way to remotely switch off a target's shields. That said, they offer no protection against kinetic weapons, which were designed specifically to counter them. Stars! offers shields as one of the defensive options (the other is armor). Certain weapons fare better against shields than armor, but shields prevent extra damage from missiles. Titanfall and its sequel not only has shields on their signature Humongous Mecha, but many have their own secondary shields as well, such as the stationary Particle Wall, the Catch and Return Vortex Shield, and the burning Flame Shield. In Level 8's tablet base defense game Modern Command, your enemies will start sending A.I. tanks and bombers that are protected by force fields. When that happens, you better research and build energized ammo of some kind fast as enemies with force fields will shrug off purely kinetic attacks. As well your base eventually upgrades to have force field screens instead of concrete walls. Shield projectors can be added to techs in TerraTech. They use energy to stop bullets, as well as over time, needing plenty of batteries to be of much use. Black & White 1 has separate Miracles to block physical and magical attacks, while the sequel combines them into one. In each case, the Miracle creates a spherical barrier of any size, which drains the caster's Mana over time at a rate proportionate to its size and the amount of damage it absorbs. However, people and Creatures can walk straight through. XRS The XRS can emit impenetrable force fields of varying size and intensity. In A Miracle of Science, Mars' "vector technology" functions like this (as well as being able to hold unconnected objects into a rigid frame). The current Inexplicable Adventures of Bob story involves Galatea inventing a force field powerful enough to deflect borfomite beams. In Drowtales the Sarghress ◊ have developed this technique to compensate for being individually fairly weak barrier warriors. Done with a more powerful individual here ◊. Although powerful, even she has to upgrade from personal barrier to deflector shield with the help of the two mana specialists behind her (white cloaks) to deflect a cannon ball. Drive: Mostly averted, but armada ships do have an energy field which vaporizes small debris. Runners: Ship-sized deflector shields are standard. They fry things that hit them. Destroy the Godmodder: Used often by high-tech entities. The Preston Cole has several layers, each one has a different effect and aegis described the workings of all of them. Averted in Orion's Arm. Although some in-universe fictional stories refer to clarketech deflector shields which work like this, the jury is out on whether such things actually exist in-universe. Most relativistic interstellar ships are covered in a thick layer of rock in front to deflect debris when traveling at high speeds. There are deflector shields but they're active systems that use a powerful laser to ionize particles in front of the ship and then magnetic fields to deflect the ions. Mostly averted in Tech Infantry, although all starships have standard electromagnetic deflector shields that protect them from micrometeorites and induced cosmic rays when traveling at a substantial percentage of light speed. Some of the larger warships have gravity-based shields created by their gravitic drives, but these are of limited utility, as it's hard to shoot out through a zone of such intense gravity that it can bend weapon beams away or crush incoming missiles. In the superhero story Worm, powers that create these are quite common — and one hero is literally called "Shielder" for his facility with them. Chakona Space: Mentioned in a few different stories. In "Ponyville Confidential", Twilight Sparkle creates a domed field over the whole Golden Oak Library to keep out unwelcome guests, like the Cutie Mark Crusaders who embarrassed her in their school's newspaper. The entire city of Canterlot is covered by a massive magical protective dome when a massive threat is known in "A Canterlot Wedding". Said barrier shatters under a massive assault of changelings when the Barrier Warrior can't maintain it. In "The Crystal Empire", Cadance shields the eponymous city from King Sombra with a similar barrier, which breaks down when she becomes exhausted. This time, Shining Armor can't use his own barrier spell because Sombra nullified his magic with black crystals. In Danny Phantom, the ghost shields are used to surround buildings or machines on numerous occasions, but only works against ghosts. Danny, as a half-ghost, has a special advantage against ghost shields in that he can pass them while in human form. Which doesn't quite make sense when you consider that he still registers as "ghost" on various equipment whether he's in human form or not... and that he can seemingly use almost all his ghost powers (minus flying) while in human form too. In Code Lyoko Season 4, the Skidbladnir and Navskids are protected by deflector shields. The upgraded Technodrome in Turtles Forever has a deflector shield that easily absorbs all the firepower that the military hits it with. In Transformers Animated, Sumdac Tower has a force-field that can be activated if the building is under attack, though it only comes up a few times throughout the series. While it is the 22nd century, and Professor Sumdac did have Megatron's head in his lab for a while, this is still pretty impressive. The Elite Guard ship can also create one. The Galaxy Trio's starship Condor One has "defense shields" that can be raised to stop incoming attacks. Winx Club several of these are put up in defense of Alfea and others throughout the show. In season three it becomes a plot point: because of Valtor's attacks on the Magical Dimension, a protective barrier serving as a Lockdown is put up around Alfea, but Tecna creates a device that can break through it, and the girls sneak out at night often (usually to fight against Valtor or deal with other problems). When they are caught, Faragonda and Griselda explain that the more they break through the barrier, the weaker it becomes. Cloud Tower has one too, that prevents uninvited people from going to the castle. Valtor and the Trix get around it by transforming into a deer and three wolves who some students try to coax into the castle for a spell. The whole of Magix has a protective barrier around it, preventing Muggles from getting in. Final Space: The Galaxy One has protective shields. In episode 10, they are deployed against the Lord Commander's hive ships. They hold the swarm off for a while, but ultimtely, the hives break through. The geomagnetic field of planet Earth serves as a natural deflector shield against the solar wind, keeping charged particles emitted by the Sun from stripping away the upper atmosphere. In Fullmetal Alchemist, one of Father's powers after eating God is to create a spherical barrier around himself which can instantly transmute anything that touches it. Yomi of has a barrier that deflects, and in some forms absorbs demonic energy, although Yusuke gets around this by finally realizing to turn off the demonic transformation and use HUMAN Reiki. I guess Yomi didn't figure humans to be enough of a threat. Also Luka/Ruka in the Dark Tournament arc, when after some foul play by a team owner, she poses as a nurse and traps Hiei and the Masked Fighter behind a powerful, painful-to-the-touch barrier; her main mistake is that the barrier works with her nurse masquerade by HEALING the people inside it, who at this point want to throttle her. It most notably heals Hiei's arm that was damaged in the first round, so she actually tips the entire tournament in the Urameshi team's favor by this accident. She almost dies when Hiei tries to bust out, and wisely leaves the force-field for hire business soon after. And technically Sensui's Holy Chi, which morphs into armor after he enters the Demon Plane. The Mages have Barrier spells which surround their body and absorb incoming attacks. Shield spells also exist, which cover only one side but could deflect attacks that would pierce barriers. There's also "Field" spells that dissipate magic energy within them, as well as magically hardened armor in their Barrier Jackets. Figuring out the right combination of percentage of each at any second during a battle requires an inhuman amount of mathematics and quick thinking. Nanoha spent most of her elementary school time in a DreamScape just for training how to figure the equations required for this and massive, massive Beam Spam. And there's AMF. Anti-Magic Field. Dissipates every spell cast inside it or entering it. Practically makes every mage inside it a sitting duck. Only the really strong ones can keep their power inside it, and even they had to improvise to keep their effectiveness. Or the really, really powerful ones can just Wave Motion Gun their way through with brute magical force. Even if the anti-magic field is a uniquely powerful one capable of holding off dozens of mages at a time, built onto an anti-planetary spaceship. Especially if the resident villanous Smug Snake is hiding on the other side of the ship (with assorted blast doors and Elite Mooks blocking the way also) while making you fight your adopted daughter. Can you say Dungeon Bypass? One of Nanoha's greatest moments. Various characters in Dragon Ball Z can do this using their Ki. Shows up a few times in later episodes of Magical Project S. Sammy "M-Shield" basically acts as a way to prevent Mana Drain, but the same term gets used for a shield that Romio uses to protect both herself and a device. The whole idea behind the offensive and defensive moves, used by protagonists of the Kekkaishi anime is force field creation and manipulation. In fact, Kekkai means "barrier". Magic shields are depicted as a basic preemptive in combat. Naturally it's sustained by the user's will. That also unfortunately means that (because most force-emitting spells are energy based) phsysical type spells require the barrier to be lowered before the spell is activated, that in itself requiring further chanting atop the obligatory barrier-breaker spell arming the already-activating spell. Later in the series, mysterious boy-like character (Filius Zect?) was revealed to essentially be the previous group Ala Rubra's Barrier Warrior. Kuu Fei: Asuna's barrier break and my combo are super effective against mages ~arune~. Magic Knight Rayearth has the spell Cresta, which projects a clear spherical barrier around the caster. Furthermore, Fuu could use her Wind magic to cast Barrier Wind, a shield strong enough to withstand nearly any assault... as long as she's prepared for the attack. Shinigami uses skull-shaped shields to defend against Asura, and at one point attempt to crush him into the ground. Kid gets a smaller version through Brew, which he uses to defend against Mosquito's attacks. Stein has a technique — experimental spirit body — which creates a human-shaped shield around himself. Used only once, but it's an example of soul wavelength being used to block attacks. Such is the versatility of souls in the series, it'd be unsurprising if the idea gets used again. Also Black*Star and Tsubaki have Shield Star. Light Shields in Outlaw Star are usually used only by individual people. They don't have the battery life to provide protection for a long time, but they can deflect just about any human-portable weapon while they're working. This turns up in InuYasha to stop Inu-Yasha's magic sword from slicing and dicing the bad guys. Sometimes he's able to break the barrier with one of Kagome's arrows. Much of Inuyasha revolves around thwarting such barriers. He later powers up his sword by cutting a barrier generating orb and absorbing its power (which turns his blade red when in use) and when THAT ends up being trumped, later gains the ability to fling gigantic shards of diamond to pierce armor/barriers. Some Kidou in Bleach are these. Also Orihime's Souten Kesshun (doubling as an Attack Reflector) and Urahara's Bloody Mist Shield. The Hyuuga have the Kaiten (Rotation), in which the user spins on the spot and deflects everything. Impassable, but also impossible to keep up for long. Pain/Nagato has two similar abilities, one destroys any jutsu by spinning energy and the other is a gravity blast. Komachi/Cure Mint gains the Emerald Saucer when she gets her power upgrade in Yes! Pretty Cure 5 GO!GO!. An extreme example would come in the form of Puella Magi Madoka Magica the Movie: Rebellion's Incubator Isolation Field, which cancels out all energy, matter and even laws of physics and karmic destiny. It's powerful enough to block out Madoka's omniscience. However, it is unknown if the Incubators could build one bigger than a Soul Gem. Witches create personal shields in Strike Witches. This becomes an important plot point when Mio can no longer create them due to her aging as a witch. Mai in Mai-HiME can use her Element to form shields around herself, enabling her to shield herself and her allies. In the manga, Yukino can do something similar with her Child. In some versions of X/1999, Princess Hinoto can use these shields with her Psychic Powers. These are Ayeka's specialty. She can throw them up effortlessly to defend her self, or, by flying at high speeds, crush the opposition. She can also fire them off as energy attacks. Various technology in the series can create these. Like Azaka and Kamidake. the Sword Tenchi can do it as well. Taken up to eleven by Tenchi and Z's Light Hawk Wings. Its heavily implied that the force needed to breach them would destroy the universe with it! This is Kinuhata Saiai's esper power in A Certain Magical Index and A Certain Scientific Railgun - she can harden the nitrogen in the air around her to the point where she can bounce tank shells off it. Interestingly the obvious example, Accelerator, doesn't count as this since he's individually reversing the vector of every projectile that touches him rather than creating a barrier in and of itself. Space Adventure Cobra: Cobra once faces a Plant Person villain protected by three satellite-like robots that generate a deflector field against any attack coming from above (the usual spot of a sniper). They're also redirecting any shot fired at the shooter, even from Cobra's mighty Psychogun. Cobra circumvents this by catching the drones off-guard, firing from below while the villain is using an elevator. Transformers Cybertron: Vector Prime is able to summon one by using his Cyber Planet Key. Bartolomeo from One Piece ate a Devil Fruit called the Barrier Barrier Fruit, a power that grants him the ability to create protective barriers by crossing his fingers. The barriers themselves can be invisible or semi-visible, resembling a pane of glass. The barriers don't have any inherent special properties, other than acting as an indestructible wall. Outside of defensive purposes, Bartolomeo can reshape his barriers into various shapes and forms, such as a large tennis racket used to swat at enemies. Ulysses 31: Ulysses carries a bracer that can generate a round energy shield that protects him against lots of attack. It comes especially in handy on an episode where he's confronted with a swarm of Doppelgänger monsters which can copy any of his equipment, down to his Ray Gun — but not the shield because it's transparent. In the late Universal Century Gundam era, Mobile Suits' engines become so powerful that they can utilize a special barrier known as beam shields which is effectively a large defensive beam saber. This made the Crossbone Vanguard so dangerous during Mobile Suit Gundam F91 as the Federation had stagnated to the point where their suits couldn't match such defensive power. This also made the League Militaire a force to be reckoned with in Mobile Suit Victory Gundam'' as they could use their beam shields independently than the Zanscare Empire could as the latter's version doubled as flight-granting beam rotors and that made things hard. Sue Storm from the Fantastic Four was originally just invisible, but she quickly gained the ability to produce force fields as well, making her ''extremely'' powerful. Brainiac 5 compensates for not technically having any offensive powers by having an impenetrable personal force field which he invented for himself. The animated version doesn't have one, but as he's a transforming robot he probably needs it less. When Supergirl joined the Legion, Brainiac 5 gave her a force field belt. Its energy shields protected Kara from force impacts and Kryptonite radiation, but the belt broke right away. In the original, '60s comic Legion, Brainiac 5 didn't so much create the force field belt as recreate the force field technology used by his "ancestor", the original Brainiac. Said shield was so powerful that even Superman couldn't punch through it, making Brainiac one of the first villains to be effectively capable of going toe-to-toe with the Man of Steel. Vril Dox, or Brainiac 2, also has a force field belt, albeit a much less advanced one. Green Lantern: Deflector shields are one of the many ''many'' things a Green Lantern Ring can create. Songbird from the Thunderbolts can create pink solid-sound energy constructs and often use them to shield herself and others. One of many explanations for Superman's -and other Kryptonians: Supergirl, Power Girl, Superboy, Krypto...- Nigh-Invulnerability is that he somehow has an invisible force field just above his skin. This also handily explains all the spandex. If he wore regular clothes, they'd just get shredded when he fights. This goes double for Kon-El Superboy, who uses Tactile Telekinesis to deflect anything that comes his way. Well, almost anything. This was explicitly the defense of Starbrand of Marvel's The New Universe, but he can control how far out it extends or turn it off, which meant he didn't have any problem getting his hair cut, or need a special costume. Jean Grey and Rachel Summers of the X-Men commonly use telekinetic force fields to protect themselves and their teammates. Presumably other telekinetic mutants are capable of this, as well. Magneto is capable of creating powerful force fields using his powers of magnetism that are strong enough to protect him against attacks from multiple superheroes, nuclear weapons, and allows him to survive in the depths of space. The Mighty Thor can create "dimension disruptions" with Mjolnir to protect himself or his allies. Nick Fury's tech division experimented with personal energy fields during the late sixties, always with near-disastrous results for the volunteers involved. Oddly enough, most of S.H.I.E.L.D. 's opponents seemed to have perfected the technology without any casualties whatsoever. During a time when his iconic shield was lost in the Atlantic, Captain America was provided with a photonic energy shield by Sharon Carter. Said shield, in addition to being an energy facsimile of his regular shield, could even be converted into various other forms, which included: a bo staff, sword, and even a larger force-shield. Unfortunately, the photonic shield didn't have the ricocheting ability that the regular shield had. Wonder Woman: Doctor Cyber had deflector shields Built into her armored suit in the Pre-Crisis continuity, before she was turned into a minor annoyance instead of a major villain Post-Crisis. In Mega Man: Defender of the Human Race, Bass has these stemming from gems on his forehead and chest. They absorb attacks rather than deflect them, which can cause him to power up. In None Piece Zoro makes a shield around his head after he asks Luffy for an apple, which Luffy throws at his head (which he had done earlier in the episode). Like most things it wasn't used earlier and it won't be mentioned again. In The Ultimate Evil, Shendu creates one made of fire when he comes between Valerie Payne and Dai Gui, deflecting the fist of his larger brother. The Pieces Lie Where They Fell: Page prefers using these in battle. It's something she inherited from her great-great-great-great-great-great-great-great-grandfather Shining Armor. Violet Parr's power in The Incredibles is invisibility and projecting force fields just like Susan Storm, but then, the Incredibles were in many ways deliberate expies of the Fantastic Four. David Lynch's film adaptation of Dune goes against convention by depicting personal shields as boxy rather than bubble-like. In Elysium Kruger carries an awesome handheld shield. He uses it twice, both times to help him survive against what would be immediate death otherwise, at the hands of 7.62mm airbursting explosive ammo and fire from the Chemrail. It seems to be powered by the powerpack he wears on the back of his body armor. Very realistically portrayed, for once, for the simple fact that although the shield stops the shot, it doesn't stop the transfer of energy to the target. Black Panther: In Wakanda, the warriors of the Border Tribe have vibranium technology laced in their colorful cloth cloaks, allowing them to erect one-man energy shields before them in battle, and employ them in group for defensive maneuvers. One of the initial series books has a man trading his personal shield — resistant even to ray gun fire — to one of the "tek-men" (hereditary technicians without understanding of the technology) in exchange for a private viewing of the generator facilities on a planet. Oh, the shield works, all right, but only for one day. Not being stupid, he brought two, AND a gun that can shoot through it. The reason why a personal shield works as a bribe is that as far as the Empire was concerned, personal shields were impossible, not because of the shield itself, but because you wouldn't be able to carry the needed generator around (thus, not even the Emperor himself has one). The Foundation, meanwhile had not only continued to develop technologically while the Empire stagnated, but, due to its home planet of Terminus being notoriously metal-poor, had primarily focused on miniaturization and resource-efficiency — and so by that time had hand-held generators capable of outpowering Imperial room-sized reactors. Also, in the prequel novels of the Foundations Fear trilogy, the Emperor has the strongest personal shield available in the Empire (a hovering device) present when he removes Linge Chen from office. Across the series: Force field technology is shaped in many different ways, creating mundane products such as climbing pitons and self-cleaning tables, to Laser Blades and spaceship shields. They are noted to be dangerous, because the fields generated are designed to be powerful, which can make even tables lethal if you use them the right/wrong way. The shields for spaceships glow when they're reflecting high-energy collisions, like asteroids or lasers. David Starr, Space Ranger: David acquires a personal force field generator, later called a "glimmer shield" because of its peculiar optic properties. It is unique because it was made by the ancient Martians who hide themselves beneath the surface of Mars. It is stated to be technology far beyond current human science, but is only used once after this story (in Lucky Starr and the Pirates of the Asteroids). In Christopher Hinz' three volume Paratwa Saga, there is a form of this called a crescent web. It protects the ventral and dorsal areas while leaving the sides vulnerable so the arms can move (usually to aim a weapon). The defensive spells in the Young Wizards series act this way, and are actually called "force fields". They also act to keep in air and heat when a wizard visits a planet or moon which has no atmosphere. Sci-fi writer Peter F. Hamilton in Pandora's Star described personal force-fields as "hardened air," implying that energy is used somehow to form ultra-strong bonds between gas molecules. The Chronicles of the Raven has the two spells Hardshield and Ward, which defend the ones the spells are casted on from physical and magical attacks respectively. The shields' strength varies by the mage. Personal shields show up in the first book of the Starfist series by David Sherman and Dan Cragg. Ostensibly these are designed to repel, or at least deflect, bolts from the plasma-type weapons the Confederation Marines are equipped with. Since 99% of trouble spots where said Marines gets deployed features combatants with no such weaponry, and the shields don't do a thing against projectiles, they very quickly went out the window in favor of "old-fashioned" body armor. In The Dresden Files, shields are a common defense used by many wizards. Harry Dresden carries a "shield bracelet," which is a magical focus that allows him to finely control his magical power to generate shields in a variety of shapes. His initial shield only produced a barrier against kinetic attacks, to defend against things like bullets, but after a cunning villain took advantage of that with flamethrowers, he developed a different focus that could defend against nearly anything, including magical attacks. In a couple of cases, he's actually used the barriers as a weapon, by using them to deflect incoming fire or altering the barrier to reflect light, creating a mirror to startle opponents. In the Incarnations of Immortality series, when Orb and Luna are young, their father, the Magician, gives each child a magical moonstone to protect the children from harm. Some Gypsies who intend harm are literally stopped from going near the children. As with large-scale shields, practically everyday military and secret agent tech in Perry Rhodan. Personal shields of assorted types tend to stop pretty much anything (exceptions are rare), but can be overwhelmed by sustained fire from suitably heavy weapons readily enough. Another fantasy example is from The Death Gate Cycle, where the Patryns tattoo magical runes all over their bodies for magical protection. However, these aren't perfect shields — in the second book, when faced against a giant monster, the main character's magical shield broke under the giant's assault with a tree trunk. The explanation being that the powerful blows caused cracks to form between the sigla that comprise the magical barrier, thus weakening and ultimately obliterating the shield. In Way of the Pilgrim by Gordon R. Dickson the personal force-shield of any Aalag soldier would allow him to hold out indefinitely against any weapons humanity could throw at him. Even nukes. The ship-board version is presumably even more robust. In the Wild Cards books, Golden Boy is protected by a "biological force field" that appears whenever he's in imminent danger of harm (whether or not he's consciously aware of that danger). The force field glows yellow, hence the name Golden Boy. Harry Potter has Protego, which seems to have two variants: deflecting an opponent's spell back at them, and a deployable shield which can apparently stop both physical objects and spells. In Galaxy of Fear, Force-Sensitive Tash Arranda can sometimes call on The Force to shield her from harm and push back attackers who are too close. Because she's so inexperienced and has never had a teacher, she can't keep it up for long and tires quickly. In Jack McDevitt's Priscilla Hutchins series, personal deflector shields have basically replaced space suits. They use more energy than a passive suit, but are much less bulky and obtrusive. In the Paradox Trilogy, Caldwell and Rupert both use personal shields which are capable of absorbing one or two shots before failing. Devi and Cotter have suits of Powered Armor which incorporate more powerful shields, capable of withstanding a larger amount of punishment. In Aeon 14 Tanis Richards buys a nanotechnology-based "armor" that essentially provides an invisible force field over her body. In addition to its primary purpose of taking hits for her, in book two she MacGyvers it into a g-suit of sorts so she can survive a harsh acceleration burn. Doctor Who: A number of force fields turn up, most spectacularly around individual Daleks in the new series. Part of what makes the Replicators so dangerous is that each of them is immune to energy weapons, possessing personal shields that absorb the shot completely. Once again, though, Kinetic Weapons Are Just Better, because the physical impact from a bullet can shatter the Replicator's components apart. The Asgard had never thought of this because they considered projectile weapons to be "primitive". An Ancient personal force field is quickly snapped up by Doctor and Egotistical Nerd, Rodney McKay. Instead of being a bubble, the force field is just slightly above the user's skin and clothes. While surprisingly powerful, lacking sufficient training in the use of its mental interface will also make it shield you from any food or liquid you intent to ingest and render you unable to remove it. An identical force field device shows up later in the hands of Lucius Lavin, a con man who uses it to fight off bandits raiding a village (whom he hired). The former Genii officer Acastus Kolya tests the shield with dynamite. Lavin survives. Kolya then tortures him by nearly drowning him in a barrel of water. The Vanir have Powered Armor with forearm-mounted energy shields. One uses this feature to protect his comrades as they abduct Daniel Jackson and Rodney McKay. Unfortunately for him, the Atlantis team is incredibly persistent and just stands there pouring bullets into the shield until it finally fails. His friends escape; he does not. Sky Tate's genetic mutation gives him the ability to erect force fields with his mind. Similarly, Dillon's suit power in Power Rangers RPM is a five-second deflective shield. More generally, the Megazords are typically said to have deflector shields in addition to the armor, with the Rangers occasionally commenting on shield status after taking a big hit. The Borg have personal shields, which also can adapt. One species from Deep Space Nine has personal shields that appears to be thin strips on their arms. They moves their arms into the way of phaser shots in order to block it. In one episode of The Next Generation, Worf Jury-rigged himself a personal force field... using a comm-badge. This hasn't made it to Starfleet R&D WHY? note For the curious, it was on the holodeck and used against projectile weapons, instead of the energy weapons seemingly universally used throughout the rest of the Alpha Quadrant, and only lasted six seconds before shorting out, indicating an incredibly high power consumption rate, making it impractical. The idea may have been in Starfleet R&D. Star Trek Online (the events of which happen about 40 years after TNG) shows Starfleet personel equipped with personal shields. Willow from Buffy the Vampire Slayer has an ability to make such shields. Charmed. Baby Wyatt had extremely powerful shields that not only protected him from harm, but did so for Piper as well while he was still in the womb. It wasn't quite as effective against power-sucking demons, though. A smattering of other characters also possessed the ability to create shields, whether through inherent magic or through artifacts. In Cleopatra 2525, the Power Trio is equipped with armbands that project personal energy shields as part of their function (they can also fire energy blasts and allow them to swing like Spider-Man). The shields can be overloaded with too much firepower. Also, in one episode, it's revealed that the shields do not protect against kinetic weapons, as shown when Sarge uses a 20th-century gun to kill the episode's Big Bad who is hiding behind a super-strong shield. Farscape: There are the personal force shields they find in that freedom fighter base — they activate only when hit by blaster fire, but then will protect the wearer from pretty much anything, up to and including lava. Unfortunately, apart from one use in the next episode, the few that our heroes manage to salvage are never used again after "I Shrink Therefore I Am," presumably because Axicor had them destroyed the moment he discovered them. Murder Rooms. In one episode there's a quack inventor trying to market a magnetic device to the Navy that can deflect cannonballs. Problem is the enemy would have to be considerate enough to use steel shot, and it's strongly implied the device doesn't work even with that. Agents of S.H.I.E.L.D. : The latest model of Phil Coulson's prosthetic hand is able to project an energy shield strong enough to withstand an explosion. He thought it would be cool if the Director of S.H.I.E.L.D. used an actual shield of his own. It is shaped like Captain America's vibranium shield (no surprise here considering Coulson is a fanboy) and sports the S.H.I.E.L.D. logo. In Stern Pinball's X-Men, Magneto uses his magnetic powers to capture and deflect pinballs before they can strike him. Like everything else in 40K, personal force fields are available in a wide variety of sizes and craziness. The Imperium, Tau and Eldar use force fields of varied effects, rarity and effectiveness to protect their higher ranking troops and Orks build "Kustom Force Fields" which they carry into battle to protect blobs of troops. Titans have Void Shields, although that's stretching the definition of "personal", while all large spacecraft have void shields or an equivalent, with the occasional possible exception of orks. Refractor Fields (Imperial) generate a dimly-glowing energy field that attempts to disperse the energy of a hit throughout the entire shield and are the "default" Force Field of Imperial Forces. The Iron Halo worn by some Space Marines is a variant of Refractor Field technology. A more rare variant is the Reductor Field, which attempts to simply nullify an incoming attack's energy rather than redirect it. Commissar Yarrick wears a Reductor Field. Conversion Fields (Imperial), which attempt to convert incoming thermal and kinetic energy into radiant energy. The more powerful the hit, the brighter the flash of light. In the spin-off game Inquisitor, a Refractor that stopped a sufficiently powerful attack had an effect very similar to a flashbang grenade on nearby models. The Rosarius worn by members of the Ecclesiarchy and Space Marine Chaplains are a compact variant of Conversion Field technology. Displacer Shields (Imperial), which aren't quite shields in the usual sense; they attempt to detect incoming attacks and teleport the wearer away. Given that Imperial teleportation tech is unreliable, poorly-understood and prone to spectacularly lethal failures, the Displacer is almost as likely to kill you as the incoming attack is. On the upshot, when the Displacer Field works, it's 100% effective since you and the triggering attack are no longer in the same place. It's worth noting that the Orks have weaponized this technology in the form of the Shokk Attack Gun. Shadow Fields (Dark Eldar) are energy sinks which absorb incoming attacks completely, providing excellent protection, though they can be overwhelmed by attacks that transfer more energy into them than the Shadow Field can absorb. Shimmershields (Eldar) project a wide-area energy field (sufficient to cover an entire squad) that interferes with melee attacks. Shimmershields offer no protection against ranged attacks, implying that they are only effective against slow-moving weapons.note Given Eldar mastery of Artificial Gravity, Shimmershields may be generating an effect that locally reduces the effective mass of any object within it with a velocity above a fairly low threshold. This would reduce the effectiveness of melee weapons, which tend to rely on mass to do damage, but would leave fast-moving projectiles, which get the majority of their energy from velocity, largely unaffected. Shield Generators (Tau) appear to function similarly to Imperial Refractor Fields, projecting a spherical energy field around the wearer that glows and crackles as it spreads the energy of an incoming attack across its entire surface. Shield and Mage Armor spells are the standard personal deflectors for mages in the thick of action. Other force effect include, well, the Wall of Force spell. Globe of Invulnerability is another spell, this time creating a globe around the caster that blocks all low-level spells anyone tries to cast through it. Also an item called Bracers of Armor. They come in eight different strengths and while considerably more expensive than normal armor of the same protective quality, they serve the same role without inhibiting mobility in any way. They are also considerably lighter, weighing only one pound. Telekinetic power "Kinetic Control" absorbs impacts while storing the energy so user can be battered and shot without any harm, then deliver all this abuse or part of it to some poor sod or piece of furniture instantly with a touch. If not discharged, it kicks even worse upon deactivation, though. The Witcher: Game of Imagination has two spells serving this role. One is capable of stopping projectiles mid-air, while the other considerably lessens all sustained hits (including those caused by projectiles). Witchers have two signs that work this way — Quen can block projectiles and even smaller creatures, while Yrden creates an impenetrable and stationary force field. Similar to the D&D example above, Exalted has discreet Essence armor, an artifact in the form of a matched set of bracers and anklets that projects an Essence shield around the wearer in combat situations. Aside from being lighter and easier to conceal (hence the "discreet"; the flavor text indicates it was originally made for diplomats, spies, and others who would want to be armored without looking like they were) than normal armor, it's explicitly compatible with Supernatural Martial Arts, which normally prohibit the use of armor. The TK Barrier talent works like this. It's basically a force field. Same with Gust Shield, except it's an insanely strong gust of wind instead of a force field. Espers with Powerful Magnetic Field can set it to repel metallic objects, granting them extra protection against certain physical attacks. Some science fiction games (including sufficiently-advanced versions of GURPS) had a forcefield-based shield... and by "shield" we mean "flat protective thingy strapped to your arm". GURPS has a force screens in Ultra-Tech and spells like "Utter Dome" in Magic. Fading Suns has loosely Dune-inspired shields that don't kick in unless an attack does a specified minimum amount of damage. Nobles use them when dueling, the trick is to strike hard enough to hurt your opponent but not so hard their shield activates. Fortunately energy weapons just have a chance of "bleeding through" the shield. BattleTech has the Blue Shield Particle Field Damper system, which is a personal shield for Humongous Mecha. However, the shield only has one purpose — reducing the impact of particle projectile cannon blasts. The Blue Shield only reduces their damage by half, and it's completely useless at protecting against other weapons. It also causes dust to cling onto the mech, completely blinding the pilot after a few minutes of operation. Being a recent innovation based on lost technology, it's also rarely seen. Genius: The Transgression: This is one of several classes of wonder that can be derived from the Axiom of Protostasia. Princess: The Hopeful: In lieu of the Healing Factor most supernatural templates come with, the titular Hopeful have access to Holy Shield, which lets them expend a Wisp to downgrade an attack by one step (aggravated damage becomes lethal, lethal becomes bashing, and bashing is cancelled entirely). Robo Manus in the Battletoads Arcade game had one of these. The last level is a shoot'em up of sorts, and you have to fight him by shooting him in the head. Eventually you will crush through his cranial armor leaving his brain exposed, making him creating a deflector shield with whatever energy he finds, so your job is to shoot him until he is unable to keep the shield running. The "kinetic barriers". Capable of deflecting small, fast-moving objects (i.e., bullets) but will yield to slower-moving objects ("so the subject can sit down without knocking away their chair"-gametext). These are the game's equivalent to "second chance armor" in the sense that it offers total protection from enemy fire, but only until the barrier's very small amount of power is exhausted and the shield cuts out. Interestingly enough, the shields' ability to only deflect certain shapes of objects traveling at certain speeds is used heavily in-game to create bullets that fly at different speeds or are shaped differently than the standard to cut through kinetic barriers more effectively. Although kinetic barriers are referred to as "shields" in gameplay, biotically talented forces like Adepts, Vanguards, Collectors, Cerberus Phantoms and Banshees use their powers to project something actually referred to on the health bar as barriers. These function very similarly, except that until the Overload/Energy Drain technology was refined in 3, barrier-using troops weren't affected by them, although in exchange they picked up a vulnerability to biotic attacks like Warp, which shields protected against. "Shielding" is one of the many Psychic Powers available in Psychonauts. The psychic's shield is, of course, made of psychokinetic energy. At higher levels, it even has a directly damaging property that hurts enemies that touch it. Star Ocean: The Second Story has several boss fights that are deliberately unwinnable (some of them require you to just survive for 60 seconds). Besides the ones that are against foes that are supposed to be "just too strong", the initial fights against the Ten Wise Men show them encased in some sort of energy field, the technobabble for which escapes me. The heroes have to search out a particular metal with which to fashion weapons allowing them to hurt them. Star Ocean: The Last Hope features a similarly invincible shields around the very first enemies you face. These shields apparently trigger when they are shot with guns, to excuse the characters' abandoning their modern weapons in favor of the RPG standard medieval arsenal. Nobody bothers to check if any of the other enemies on the various planets they go to might be less Immune to Bullets. All the incarnations of the Power Suit include energy shielding; deflecting enemy attacks requires energy from the suit's onboard tanks. Also, the Parasite Queen has a shifting force field. Sometimes it gives you a nice opening, and other times it spins to make it highly unlikely that shots will penetrate. It is implied that what makes Metroids so tough is that they use their natural energy-channeling abilities to form energy shields that protect themselves from harm (doesn't stop them from freezing, though). Perhaps because cold is a lack of energy. They use up their energy heating themselves back up, and don't have any to spare for shields until they do so. The Legend of Zelda: Ocarina of Time features Nayru's Love, a spell that protects Link with a blue diamond-shaped barrier for one minute. The Legend of Zelda: Breath of the Wild features Daruk's Protection, which protects its user with an orange spherical barrier. It is first used by Daruk and his descendant Yunobo, and Link eventually gets it as a Bequeathed Power. Princess Zelda fights with magic rather than weaponry, outside of her Final Smash; one of her spells is called Nayru's Love, which tosses up a short-lived protective barrier around her that deflects attacks. And then there's the Team Star Fox reflectors, that repel any projectiles, but not regular attacks. And the standard method of blocking manifests as a shield around a character. The title character from The Guardian Legend is protected by a personal force field, which only materializes briefly when she gets attacked. When her life meter drops to zero, the shield can no longer protect her, and she will get destroyed if attacked again. "Personal energy shields" in the Star Wars universe. They're canonically inconvenient, expensive, get unbearably hot when used for longer than a minute (hot enough to burn the crap out of whoever touches them and bake the user to death), and not used often, to explain why the characters don't carry them all the time, but personal shields are featured much more prominently in the video games, where just about every protagonist seems to have one. Examples include Knights of the Old Republic and Jedi Knight. Later games in the Dark Forces Saga feature the Force powers "Force Protection" and "Force Absorb", which function as deflector shields against weapon and Force attacks, respectively. The Player Character in Flashback is a One-Hit-Point Wonder with a personal shield. Hits drain the shield, so Hit Points are restored at a recharge station. Personal deflector shield pickups, though they do not regenerate except in the old-fashioned way: by picking up another shield. They can make thrown weapons like the Combat Knives bounce off, and any weapon that would normally be a One-Hit Kill exhausts the shield entirely without doing any health damage, giving the wearer a half-second greater lifespan, possibly more. There's the TurtleSim in the Combat Simulator mode, which spawns with a shield stronger than any human player can get, but also moves much more slowly. The Medic can, through healing his allies, acquire energy to power an "Ubercharge", an 8-second glowing shell of indestructibility for himself and his patient. The Engineer's Wrangler creates a shield around his sentry, granting it greater protection while he's directly controlling it. Early editions of the World Heroes games had sorcerer Rasputin use these to block incoming attacks. Later ones had him turn to stone as a defensive measure instead. Spartans, Elites, and Brutes have energy shields over their armor, while the Jackals carry round hand-mounted shields. They can be worn down, especially by plasma fire, or temporarily disabled by a charged Plasma Pistol shot. There are also a number of deployable varieties, notably the Bubble Shield and Deployable Cover. The Bubble Shield is particularly notable because it can't be worn down (though it only lasts a short time before running out of power). Halo: Reach's Armor Lock renders the user impervious to all damage, at the cost of making them 100% immobile. Forerunner Sentinels and Halo 4's version of Promethean Knights have typical energy shields, while Promethean Watchers can emit a hard light shield to protect allies; the Watcher's shield generator can also be used by Spartans. Section 8 has shields which operate as an regenerating extra layer of health. However, these also are bypassed at close range, allowing for direct damage to armour, which needs to be repaired. Since the game allows the player to customize these attributes (among others), careful consideration must be made to whether one will be doing a lot of close combat or not. Appeared in Jak 3: Wastelander in the form of one of Jak's Light Eco powers. Appeared in Jak X Combat Racing in the form of a Red Eco pickup. Appeared in The Lost Frontier in the form of a Green Eco Beehive Barrier. City of Heroes has the "Force Field" buff set, which is a straight use of this trope, however, there are also many other protective powers, such as sound waves (whu...? ), ice (hey wait...) and FIRE (AAAAGH!?). There's also a personal armor set called Energy Aura which is technically this. Kirby, in his Mirror form, gets a Reflector Shield. In every MOTHER game, there is at least one Franklin Badge, which reflects lightning-based attacks for whoever is carrying one. In MOTHER 3, this ends up being a bad idea..
One of the powers available to the protagonist in Advent Rising is the "negate" power, which manifests as either a carryable or placeable rectangular force shield or a player-encompassing bubble that blocks all attacks for as long as the protagonist has the energy to sustain it. Alas, this isn't all that long. The Assassin in Monday Night Combat has a deflector shield in the form of a smoke bomb, yes, a smoke bomb. Mage-type Shades in NieR can project a Sphere of Power around themselves or their allies that make them impervious to damage, or at least negate a very large fraction of it. Nier himself can call upon Weiss' Dark Wall spell, which can cast an invincible rune-inscribed wall of limited duration in front of him —but only directly in front of him, and it's fixed in place once cast. Unless in a subsequent playthrough, going for the extra endings, your level is high enough. In which case, charging it completely will form a bubble around you similar to the ones the Shades have that makes you immune to magic. The "Shield" spell in Final Fantasy VII makes the target invincible for a period of time. Mage character Evie has magical shields as her main source of defense. These block all magical and physical attacks; but only seem to extend as far as the surface of her skin, since clothing and armour can still be damaged (underwear can't be damaged, but that seems to be mainly due to the devs aiming for a PG-13 audience). As of the "Labyrinth" expansion, Evie aquired a skill that creates a large, crystal-shaped shield that offers complete invulnerability for a short time. Casting time is instant, but casting cost is high. Unlike most personal shields (and her normal magical shield), the character is fully immobilized inside (curled up in a ball); although the shield itself can be knocked around by enemies. In World of Warcraft, several different kinds of personal force shields are available to player characters depending on their class. Since the visual effect looks like a vaguely glowing ellipse around the character, they're often referred to as "bubbles". Paladins, most famously, have Divine Shield, which makes the paladin completely immune to all damage for 8 seconds. They also have a spell called Hand of Protection which they can cast on their fellow party members, which makes them immune to physical damage for 8 seconds (but does not prevent magic damage). Priests can cast Power Word: Shield on themselves and others, which absorbs a certain number of damage points before collapsing. Warlocks who have summoned a Voidwalker can "sacrifice" that Voidwalker, which throws a protective barrier around the Warlock. Like the priest's shield, this barrier absorbs a certain amount of damage and then fails. Turtles and Beetles, two of the Hunter's Pet species, have racial abilities called "Shell Shield" and "Harden Carapace" that temporarily reduce all damage done by 50%. The graphic for the abilities is a translucent golden dome of hexagonal panels forming a shield over the Turtle/Beetle. Mages learn Ice Block which prevents all damage but also prevents all actions for 10 seconds. A more traditional example would be Ice Barrier which lasts a minute and prevents a given amount of damage (based on spellpower). Against weaker enemies, that latter can functionally prevent all damage done to a mage. Borderlands feature many shields. They are mainly an additional HP gauge that can regenerate with time. If the shield you are currently using isn't up to the level of the enemies you are facing, you will not last. Some shields have special properties, rendering them less susceptible or even immune to different elemental effects. In Sonic 3 & Knuckles, the three shields used by the heroes are able to deflect various types of small projectiles. Made even cooler when the Fire shield makes most fire-based attacks pass right through, the Lightning shield doubles as a ring magnet, and the Water shield lets you breathe underwater indefinitely...until the time limit runs out, of course. These three shields returned in Sonic Generations. Your tank can upgrade its energy shields up to three times. Getting hit will decrease the shield level by one. However, there are many attacks in the game that will destroy you regardless of shielding. The "Reflex Aircraft" enemies have an energy shield around them, this one has the added bonus of spraying indestructible purple shots everywhere should your regular attack damage it. However, their shields are useless against your special weapons. The Perils of Akumos lets you manufacture your own from the game's precious minerals. The Unreal series has frequently used energy shields as a form of armor - the original, Unreal Tournament, and UT3 have them as the best form of protection, though rarer than normal body armor, while in Unreal II: The Awakening, the Championship subseries and UT2003/2004 they are the only form of protection. The latter three also feature the Shield Gun, which is always on-hand and can be used near-indefinitely, but is less effective than actual armor. In Evolva, one of the skills you can get allows you to use it. It makes you invulnerable during the time is turned on, except against lava (you'll still catch fire as normally, although you won't lose health until the shield wears off) and sea water. In the FEAR series, the Power Armor and Elite Power Armor units you fight usually use energy shields. Also the Phase Casters and Commanders in the third game. The original Syndicate had these as a researchable item, which enemy Agents could also be found with. In the reboot various mooks have ones that are Immune to Bullets; you must Breach them to bring them down first before the mooks can be damaged. The series has long had a "Shield" spell, which protects the user from incoming physical damage based on the strength of the Shield spell being cast. There have also been a number of elemental and general magical variants, which protect from incoming magical attacks. Daedroths, a crocodilian form of lesser Daedra, are capable of casting a Shield spell upon initiating combat, reducing the amount of physical damage they take. Skyrim adds a subversion with "Ward" spells. Ward spells spell protect you from magic attacks (as long as the spell being cast isn't too high level for your barrier) but instead of deflecting it absorbs the energy from the spell. Naturally it's a spell in the Restoration school of magic. Ward spells reappear in Online. Armored Core 4 and for Answer features Deflector Shield protecting your Armored Core called Primal Armor. In for Answer, your shield can even be weaponized, turning it into an explosive blast of energy that deals massive damage and completely strips other Primal Armor in the vicinity thanks to violent reaction between both. Note that this shield doesn't deflect as much as reduce impact with solid weapons due to the forcefield slowing the velocity of incoming projectiles. Bolts of laser penetrates it, plasma plays merry havoc with it, getting hit repeatedly, getting hit with something with faster-than-supersonic speeds, get hit up close either with a laserblade or a super-dense pilebunker will ruin the forcefield. On top of that, engaging extra boosters in your mech consumes the forcefield, and it's made from a highly toxic particles. Despite all that though, getting hit without it reduces your mech into a fiery wreck very, very fast, so it is useful to a degree. Assassin's Creed III: In the exposition, it is revealed that one of the technologies perfected by the First Civilization was a personal forcefield (a limited version of which you can obtain for Connor in a sidequest). One of the "methods of salvation" they attempted was to scale this up to a planetary shield, which they lacked the energy to accomplish. The ending appears to involve some variation of the original concept. Some of the aliens in Fallout 3: Mothership Zeta have these, which don't necessarily deflect, but greatly increase their damage resistance. Their frequency and shield strength increase with the player's level. One of the highest-tier Psionic abilities you can get in System Shock 2 is this, enabling you to put up solid walls of Psi energy to deter enemies. They aren't permanent, though. In Vivid Conceptions, a "telekinetic shield" is the weapon of the protagonist—it kills or harms nearby bugs, and gets rid of destructible blocks. Booker earns not one, but two deflector shield type powers. The first is given to him as an Infusion by the Lutece Twins, which causes him to generate an "intrinsic magnetic field" that absorbs damage for brief periods of time, in the "regenerating temporary health" fashion. The second version is acquired late in the game, in the form of the "Return to Sender" vigor. Its first function generates a much more powerful magnetic bubble that deflects projectiles for a short period of time. The second function catches projectiles and crushes them into a semi-molten mass which Booker can then lob back at the offending foe(s). In Xenonauts, some larger alien ships are equipped with such. Curiously, while their efficiency is absolute, they take long to recharge, which has a major impact on air combat tactics. In Emperor: Battle for Dune some House Ordos vehicles are equipped with shields. Like the books they explode when hit by lasers but the detonation just destroys the target and the shooter instead of producing a nuclear reaction, not that there are many laser-equipped units outside that House. And they attract worms which would explain why no one else uses them. Personal shield generators serve as your armor in Phantasy Star Online and its offshoot games, which explains how characters can get away with wearing whatever they want in battle. The first two games in the Kingdom Hearts series had spells for this, Aero and Reflect respectively. Aero created a lasting barrier that halved any damage received, while Reflect produced a Beehive Barrier that briefly negated all damage, with both spells gaining Collision Damage and Attack Reflector properties when upgraded. The protagonist of the first-person shooter Übersoldier has the ability to temporarily generate a forcefield around himself that stops bullets. What's more, he can use it offensively, by launching the stuck bullets back at the enemies. One of the special weapons is the Bubbler. When activated, it creates a bubble around its user that makes them temporarily invincible, making all damage sources push them away instead. These bubbles can spread to allies by contact, which in the right situations can completely turn around a battle. The Splash Wall sub weapon is effectively a throwable version of this. When thrown, it creates a raining wall of ink that stops enemy attacks dead in their tracks and instantly splats anyone foolish enough to walk into it. They stay on the field for a limited amount of time, but do dissipate faster with damage. Factorio has personal shields as a late-game item that can be slotted into the modular armor or Powered Armor. Individual shields don't have much health - especially the standard MK 1 shields - but they regenerate significantly faster than health. As they are massive energy hogs when recharging, they are difficult to power until the portable fusion reactor is unlocked. Standard kit for player characters in Star Trek Online, though only higher-grade mooks have them. In Eternal Fighter Zero, Shiori Misaka can summon a force field around her, which protects her from projectile moves, and favoring her long-range game. Beyond: Two Souls: One of Aiden's powers is to protect Jodie by projecting a force field around her, though he really has to focus hard to do it. This allows her to do things like jump off a moving train at high speed, deflect bullets, and ram straight through a police barricade on a motorcycle. In Path of Exile, all armor with Intelligence requirements innately adds some amount of Energy Shield, which acts as a second layer of health that regenerates on its own. The only major caveats are that Chaos damage ignores your shield, no flasks restore it the way life flasks do for your life stat, and in general it's harder to make a functional character build that relies on Energy Shield than one focused on increased life and armor. Road Redemption has enemies that use these, which swords and tasers are specifically good against. Generally powerful weapons such as guns will also tear through them pretty quickly. You get one in Germination with a high enough kill streak. Wolfenstein2009 features a personal shield as one of the Veil powers. Both the player (with the right crystal for the Thule Medallion) and enemy Scribes are capable of projecting them, the latter with the choice of either protecting themselves or a pair of nearby mooks. In Destroy All Humamns, Crypto has a shield that regenerates if he doesn't take damage for some time. If the shield goes down, he's able to be killed. In Mogeko Castle Moge-ko has one as a special skill, Moge-ko Shield! It's strong enough to block an RPG round without issue. Archer of Fate/stay night can summon one of these. Kind of a strange example, in that it's theoretically an actual physical shield that a warrior might carry — but it's a legendary weapon that can deflect anything and he can summon it as a magical ability, so it works out to be more like deflector shields. Aura serves this purpose in RWBY and also doubles as a Healing Factor. It's powered by the user's soul, which the monsters populating the Adventure-Friendly World are noted to lack. In Drowtales potentially all fae, depending on their skill and strength in mana. Seen in the last panel here ◊. In Pulse, the lead and her partner wear flying Powered Armor in their roles as super-heroines. Each set of armor has a repulsive shield that can sense incoming objects or energy, activate, and bounce any item away. Although they are not immune to recoil or reaction from the impact. In El Goonish Shive, Greg can create them using ki . Nioi is also capable of creating them through unknown means. Runners: "Body shells". They have a small opening, though — Cember can shoot through it. In The Order of the Stick, the early representation of the spell "Protection from Arrow" is of a bubble deflecting projectiles, falling under this trope. SCP Foundation, SCP-2099 ("Brain in a Jar") . One of SCP-2099's inventions is a force field generator. Unfortunately the Foundation can't examine it because SCP-2099 has forgotten how to turn it off. In the Whateley Universe, not only do some mutant powers (like some Enegizers or PK supermen) have them, but other mutant powers (the devisers) may be able to make personal, portable force fields. Chakona Space: Personal shields are directly mentioned a few different times in multiple different stories. Eric the Cavalier in the Dungeons & Dragons cartoon has an invulnerable magic shield; he usually has to physically deflect threats with it, but occasionally for things like a rockslide it'll generate an actual force field. Danny Phantom: One of Danny's many ghost powers is a shield. It usually comes in two varieties, a wider, weaker one or a smaller, deflective one. Kim Possible has a supersuit with a built-in shield. Other shields are shown occasionally, including one used to stop Ron, who has been villain powered to destroy anything by touching it, from destroying things with his hands. In Code Lyoko, the Guardians are shimmering forcefield spheres which are used by XANA to imprison a hero on Lyoko. Odd can also create a personal shield starting with Season 2. In Barbie & The Diamond Castle, the stones that Liana and Alexa wear around their necks create a visible barrier that shields them from the villain's evil spells. Later, they're able to use the instruments in the title castle to create a similar barrier that not only guards them, but reflects the spells back on the villain. Creating energy shields, either as flat planes or enclosed domes/spheres, is one of Gwen's most-used powers on Ben 10: Alien Force. Batman Beyond has a villain called Repeller , who could use his impenetrable force field both offensively and defensively like Sue Storm, with enough force to break titanium. He was defeated when Batman lured him near an active giant turbine; the extremely loud noise caused him to deactivate his suit.note The suit's nature made it impossible for him to cover his ears. Batman: Gotham Knight. In "Field Test", Lucius Fox invents a device that can deflect bullets, but when a ricochet injures a criminal, putting him at risk of violating his Thou Shalt Not Kill rule, Batman decides not to use it any more. Twilight Sparkle can conjure these with her magic. They're quite powerful, too, as she can even block Discord's power (although she was wearing the Element of Magic in this instance). Twilight's brother, Shining Armor, and sister-in-law, Cadance, can also do it due to it being their special talent. He's the one who conjures the Canterlot shield mentioned in the large-scale section. In "Three's a Crowd", Cadance protects herself and Twilight from Discord's "Blue Flu" with a kind of magical barrier she calls a "personal health bubble". In the season 4 finale, with her power boosted by the other three alicorns, Twilight can generate a shimmering aura that protect her against Tirek's energy blasts as well as his brute strength — including when he throws her into a a mountain, and then bull-rushes her through said mountain. Unfortunately, Tirek can also create such a personal shield (thankfully for him, or Twilight's first salvo would have vaporized the villain), meaning the fight ends in a stalemate. In "The Cutie Map  Part 2", Starlight Glimmer can cast a spell to create a shimmering dome-shaped magical shield, using it to push away the angry townsfolk. Once she recovers her cutie mark, Twilight copies her spell to protect the townsponies from Starlight Glimmer's magical attack. "The Crystalling  Part 2": Both Shining Armor and Starlight Glimmer use one to protect themselves against a random magic beam fired by Flurry Heart. Starlight's is of the usual dome shape, while Shining's looks like a real knight shield. Unfortunately, the beam ricochets off the shields and destroy a most important book. "Every Little Thing She Does": Twilight and Starlight's magic training in the beginning include magical barriers, and we see several types in display. First Starlight conjures a personal round shield (Captain America-style), then Twilight creates a hemispherical bubble, followed by Starlight encasing herself in a crystal-shaped field. In "To Where and Back Again  Part 1", Trixie freaks out badly upon meeting with Thorax, forcing Starlight to encase her in a bubble shield that is soundproof. Trixie spends the next few moments floating inside, screaming, panicking and slamming her hooves against the barrier to no avail in complete silence. "A Royal Problem": In the dreamscape, Celestia erects a forcefield around herself and Starlight to protect them from the literal firestorm unleashed by Daybreaker. She later leaves Starlight in the shield in order to fetch Luna. Nightmare Moon also creates an opaque, black bubble shield to withstand Daybreaker's searing Breath Weapon. Young Samson & Goliath episode "Nerod". One of Nerod's gladiatorial robots can generate a force field to protect itself, and Nerod activates a force field around his arena box when Samson throws a robot at him. Steven Universe can create a magical bubble shield that'll shrug off anything from a harpoon gun to oceanic pressure. Its size varies a bit, but he can usually fit about two or three people inside. Space Ghost: Space Ghost could generate a force field around himself using his Power Bands. It could be used to prevent damage or attack nearby opponents. It has become apparent that DARPA employs Red Alert fans. You know the Iron Curtain force field from that game? They've made it a reality . HOWEVER, Red Alert had it right: the Soviets invented the system in the '70s, and even fielded it in Afghanistan (with disastrous results — it worked too well, protecting the vehicle, but consistently destroying objects in its vicinity). Recently, the Russian Armed Forces created a version 2.0 (well, more like "dash-M", the Russian military equivalent of 2.0). Israel's TROPHY system which protects tanks and other armored vehicles from incoming anti-tank missiles. DSTL, which is basically Britain's DARPA, has developed electrically charged armour for tanks, and hopes to deploy it on a new fleet of armoured vehicles sometime in the next ten to twenty years. Child 1: No force fields!